If I could sum up the new Berczy Park, it would be a heavy expression of changing landscapes mixed in with a bit of whimsy — in a city that perhaps needs a lot more whimsy. One gets that immediately with the cat greeting patrons on Scott Street. Dogs populate the inside and outside of the pool, water cascading out of their mouths and into the bone-topped fountain. Well, there is one confused feline among the canines, too. Part of the appeal of parks is the context they exist in. Think Withrow Park, Christie Pits, and Trinity Bellwoods and how crucial they are to the larger Riverdale, Christie Pits, and Queen West Queen neighbourhoods, respectively. 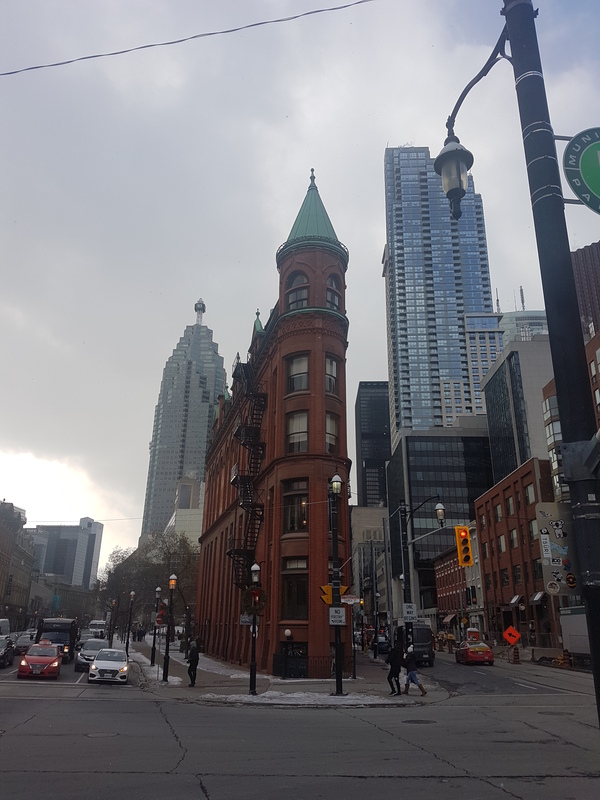 While the revitalized Berczy Park is going to be huge in the Old Town-Downtown Core area, the interplay between the park and its immediate surroundings is most intriguing. Having the fountain and the 19th century streetscape to its south as a backdrop makes for a perfect scene. Robert Rotenberg in Old City Hall describes this stretch of Front East as having a “comfortable, almost European feel”. With the addition of the park, I think this holds even more true. In particular, the Beardmore Building, 1872, is my favourite of the row with its beautifully restored yellow brick and arched windows. 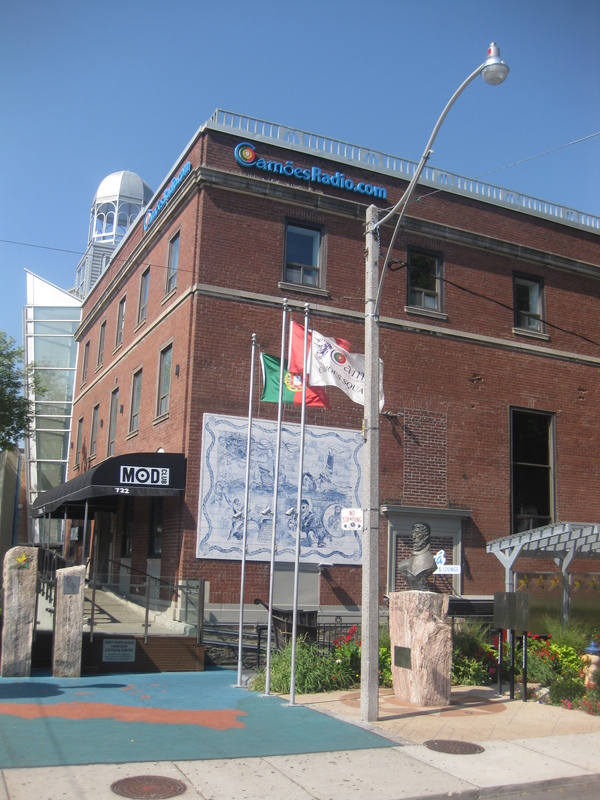 The existence of Berczy Park is bittersweet in that the triangular block was once filled with warehouses and shops like the Beardmore. 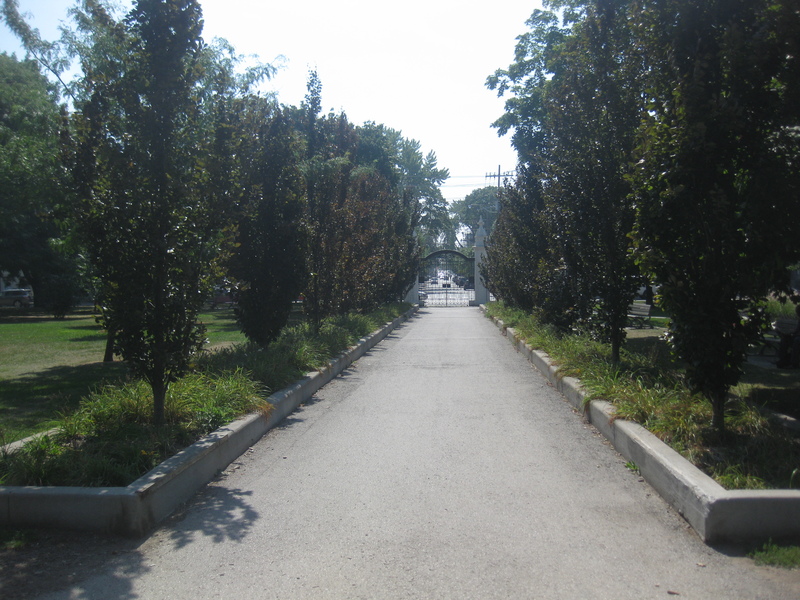 Beginning in the late 1950s but accelerating in the 1960s, these historic rows were knocked down, became parking, and then finally usable public space in 1980. It’s easy to lament the loss – and indeed, we should (a plaque showcasing the former streetscape, anyone?) – but at some point we should move forward and make the best with what exists. Fortunately, that point has been taken very well Berczy Park. 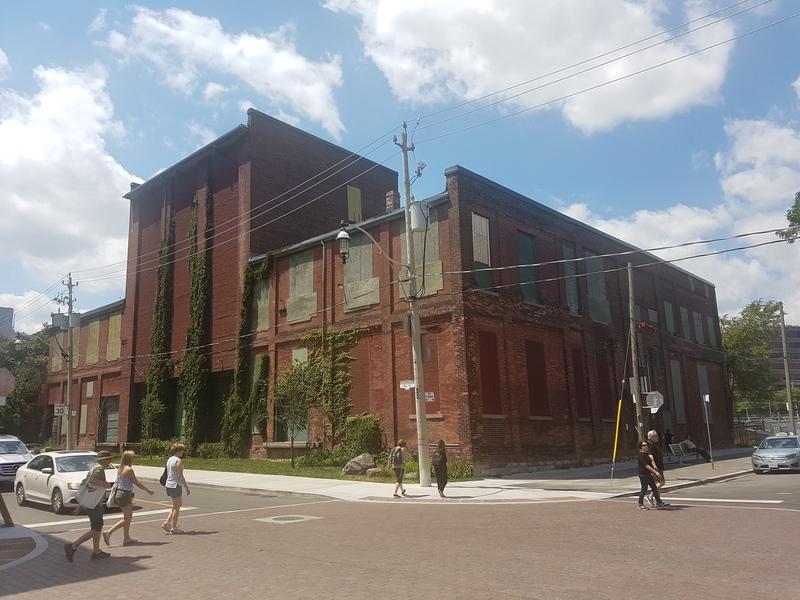 Looking east, above more seating and gardens, one sees the giant mural draped across the back of the Gooderham Flatiron Building. The artwork was commissioned for the opening of the park in 1980. 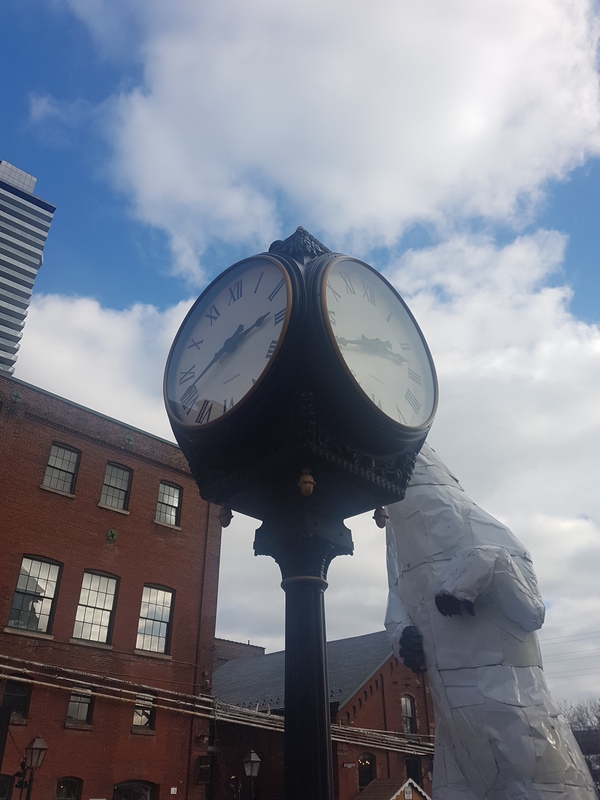 Below it, an art piece stands for the park’s namesake, William Berczy, a settler in the Town of York and the communities along German Mills Creek in Markham. 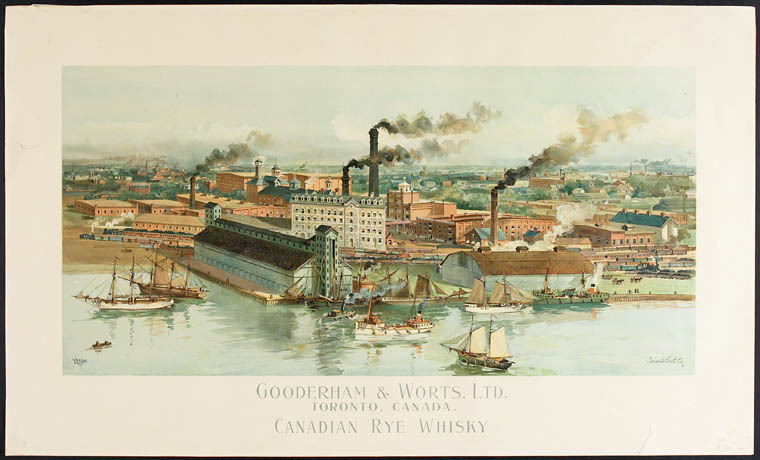 Then, there’s the Gooderham Flatiron Building itself, at one time the great headquarters of Toronto’s brewing and distilling industry. It’s perhaps the most imaged structure in the city. 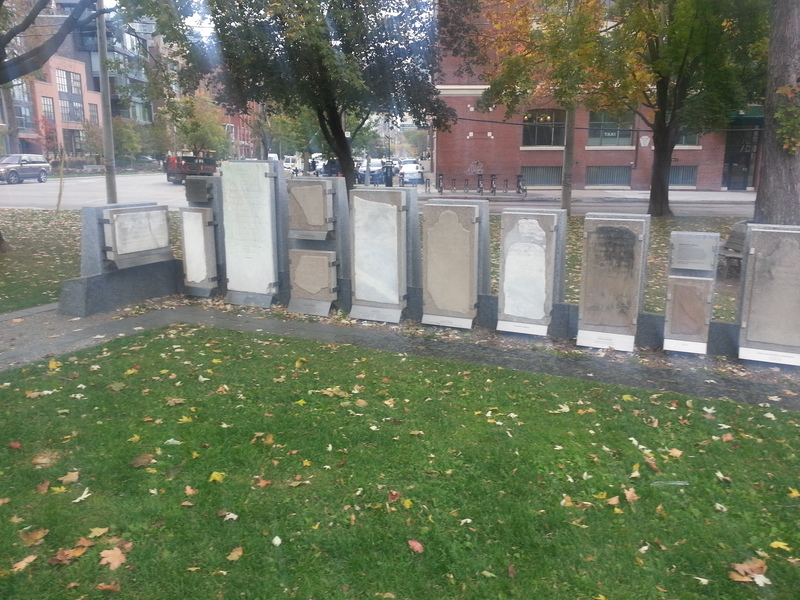 With the updated Berczy Park, it’s in a position to be captured even more. While its lasting existence seems so natural, the Coffin Block actually manned the odd intersection before it. I would say this is a case where heritage replacing potential heritage was not so bad. 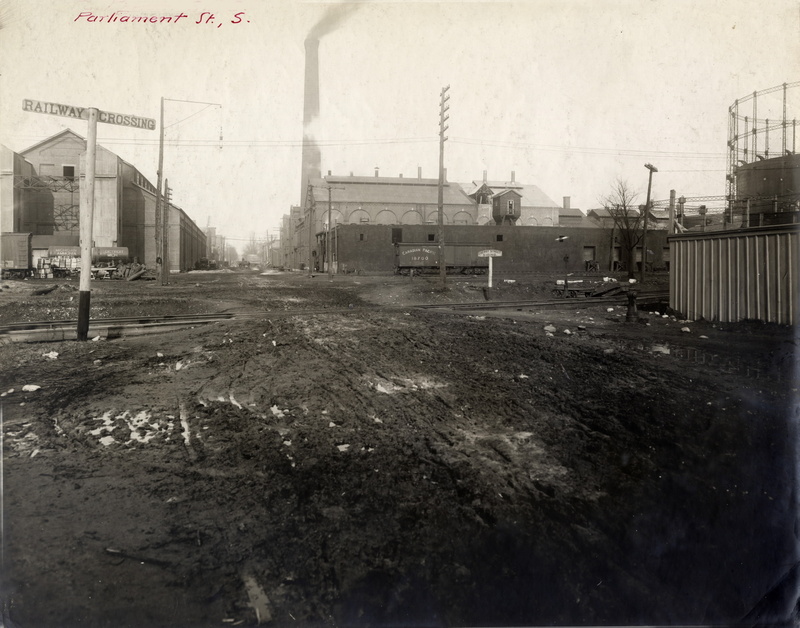 Wellington St. E., looking w. from Church St., 1888. Credit: Toronto Public Library. 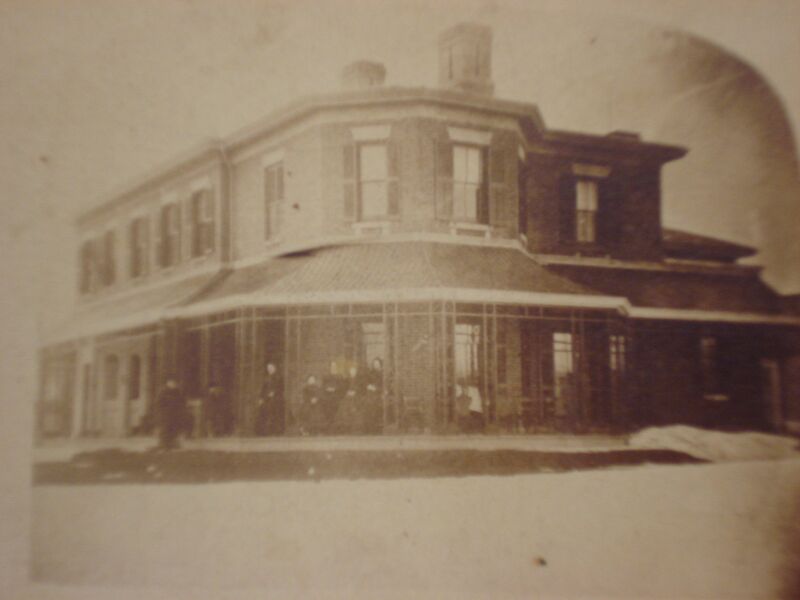 I was first introduced to The Ward several years ago through a compelling archival photograph. It was of an impoverished child standing in the debris-filled lane of what looked like a ‘slum’. In the background were the unmistakable Romanesque Revival towers of Old City Hall. The disparity between the two places – the majestic civic heart of the city and the desperate ‘ghetto’ literally at its doorstep – struck me at the time. And it still does. 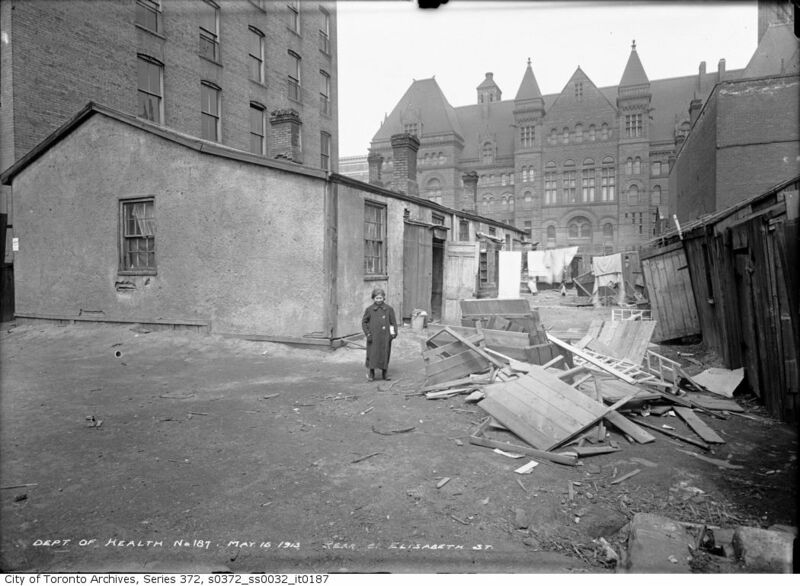 Even more striking is that photo was taken in what is now the southern end of Nathan Phillips Square. Rear of 21 Elizabeth Street, The Ward, 1913. 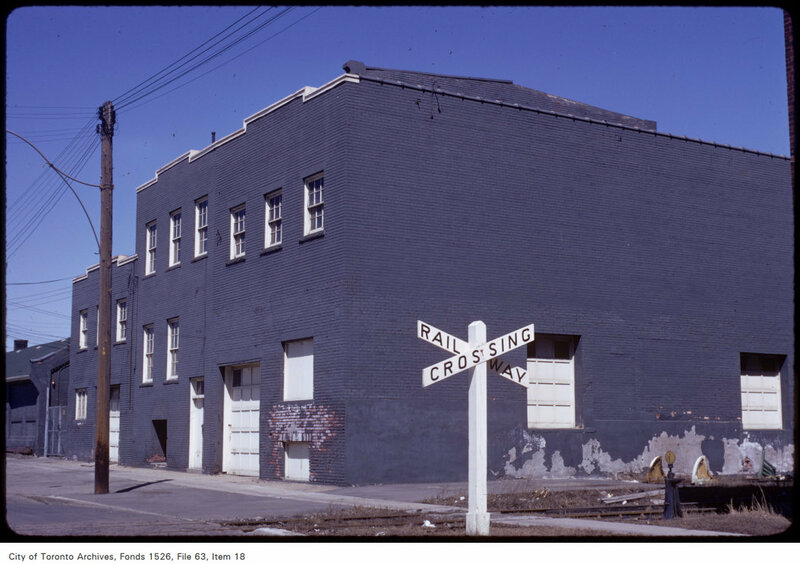 Source: City of Toronto Archives. 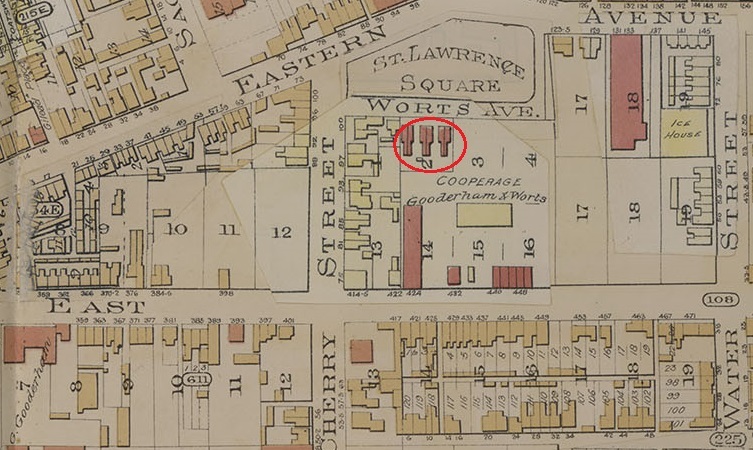 The story of St. John’s Ward is very much one of lost geographies (like in the photo), lost narratives, and how and why we remember or don’t remember. 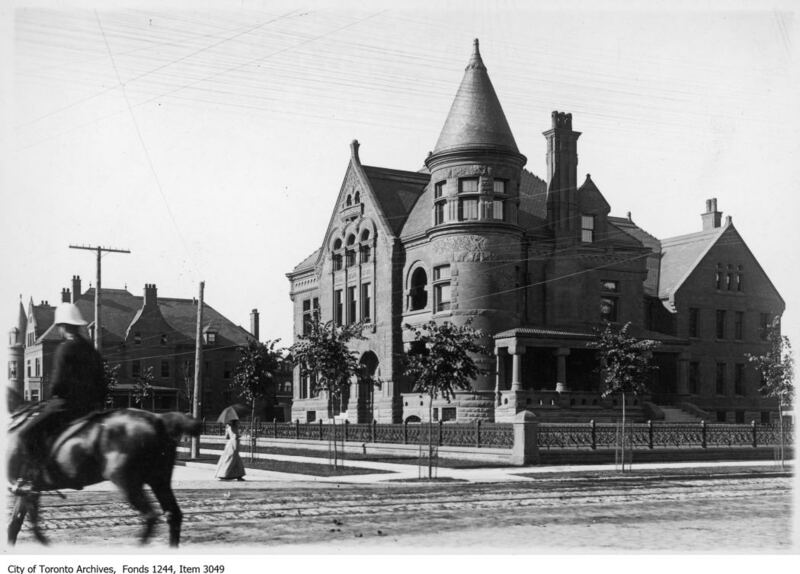 The Ward’s former borders were from Yonge to University and College to Queen. Those streets still exist of course, but the built form between them largely hasn’t survived. For a long time, the stories associated with those landmarks and their Chinese, Italian, Jewish, and Black communities also went underground. 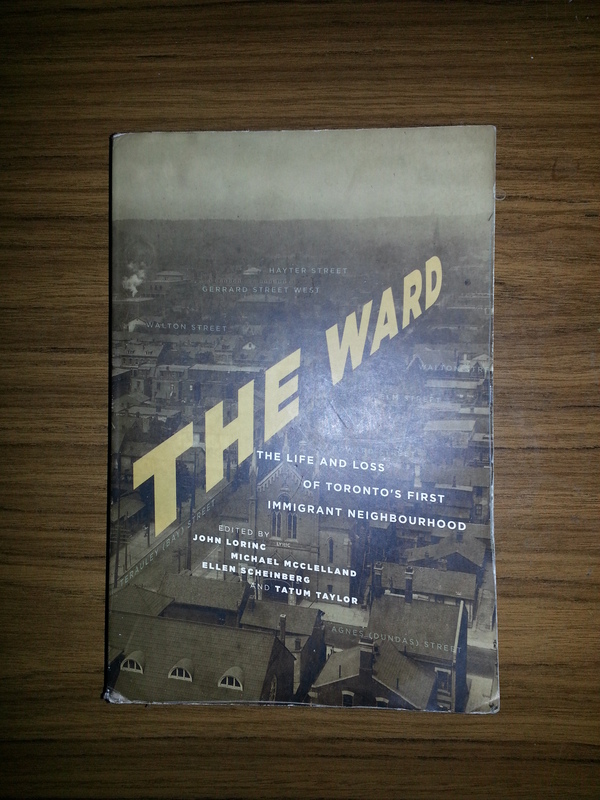 The 2015 release of The Ward: The Life And Loss of Toronto’s First Immigrant Neighbourhood was an excellent step in revealing those narratives. The book was co-edited by John Lorinc, Ellen Scheinberg, Michael McClellan, and Tatum Taylor, and features the great contributions of many talented writers. It is easily one of my favourite titles in the Toronto History genre. Today, “The Ward: Representations and Realities, 1890 – 1950” continues that work. 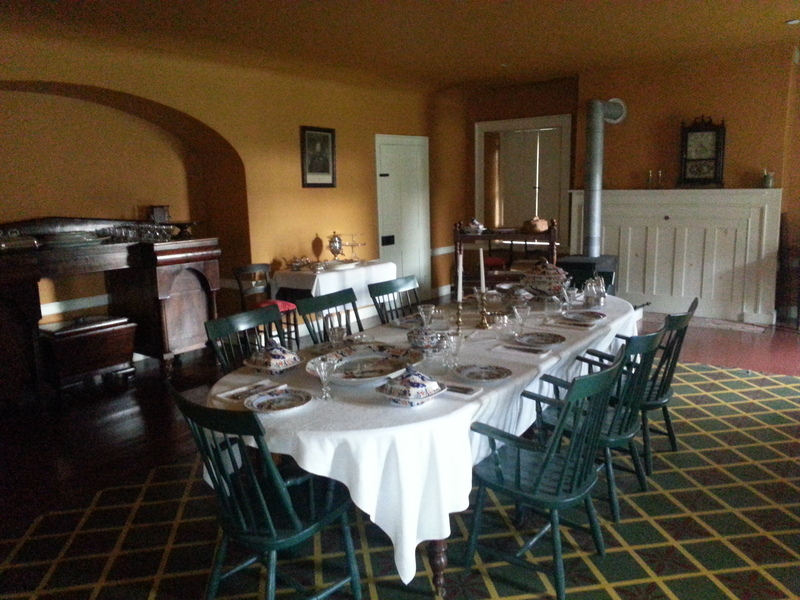 Part of the Myseum of Toronto’s 2015 “Intersections” festival, “The Ward” exhibition is housed in Campbell House Museum, the 1822 residence of Sir William Campbell, a former Chief Justice of Upper Canada. 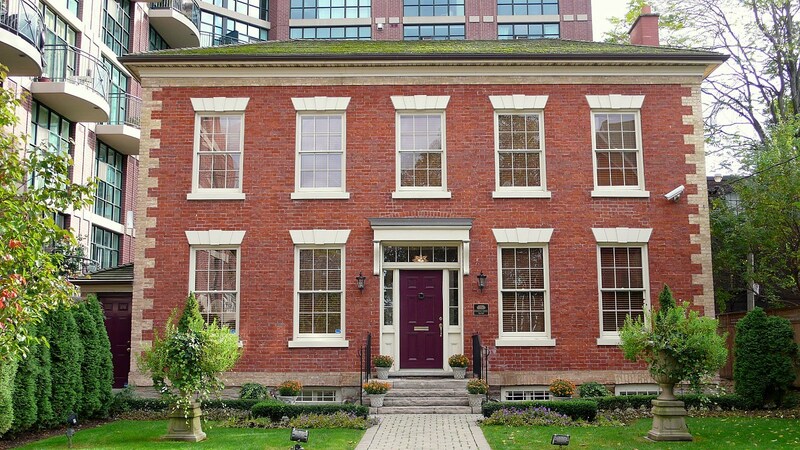 In 1972, the Georgian-style house famously moved from its original location on Adelaide Street to Queen and University. The challenge of interpreting and showcasing The Ward’s histories is the lack of contemporary borders attached to those stories. 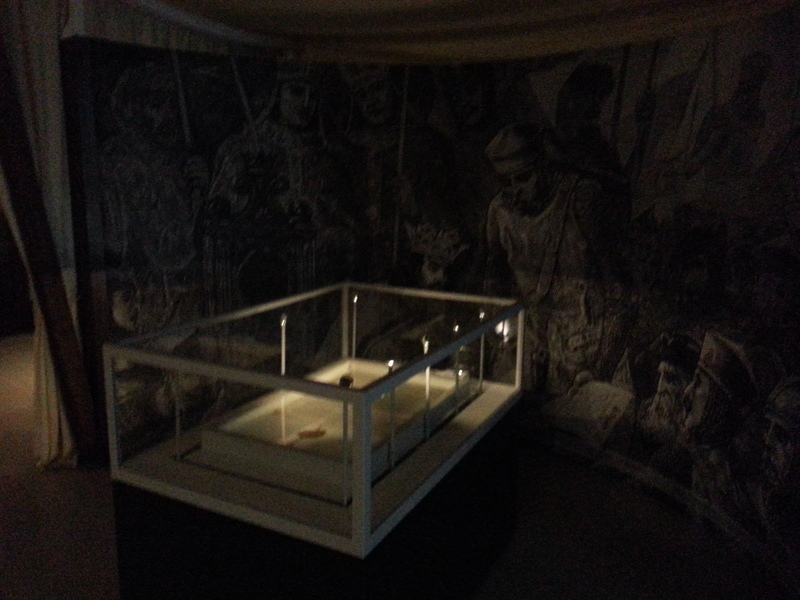 Thus, from a museological perspective, it affects the kinds of artefacts one has access to. 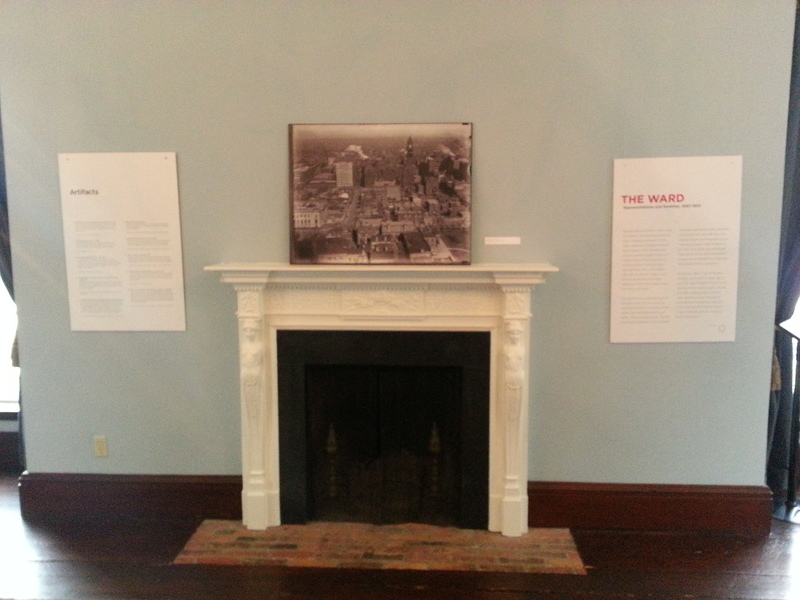 Photos of The Ward are abundant, so the curators – Paul Bishop, Daniel Panneton & Marisa Strom – had no issues there. Photographer Arthur Goss, at the instruction of the health department of the day, did a remarkable job of documenting the troubling conditions of the enclave. 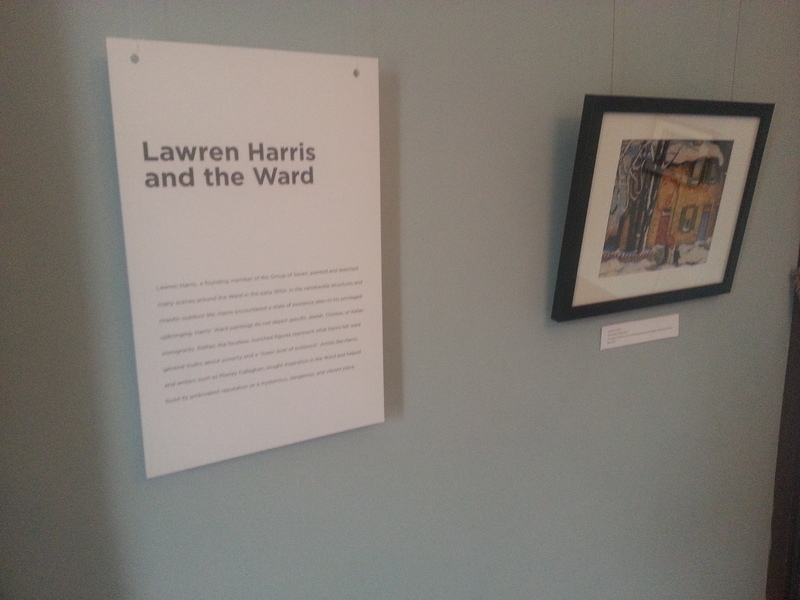 The show is organized thematically with well-displayed panels and pictures about The Ward’s politics, labour strife, Lawren Harris’ artistic take on the area, and other realities. 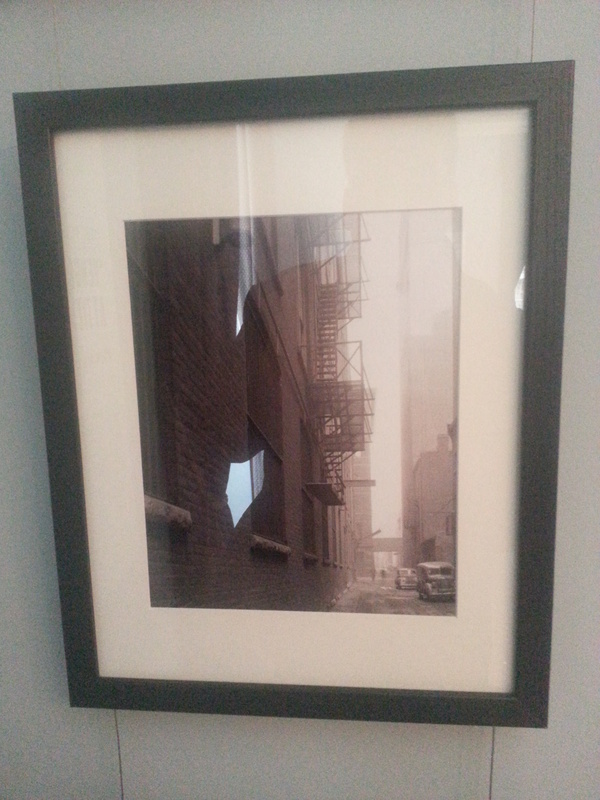 New to me was Albert Lane was one of Toronto’s notorious laneways. 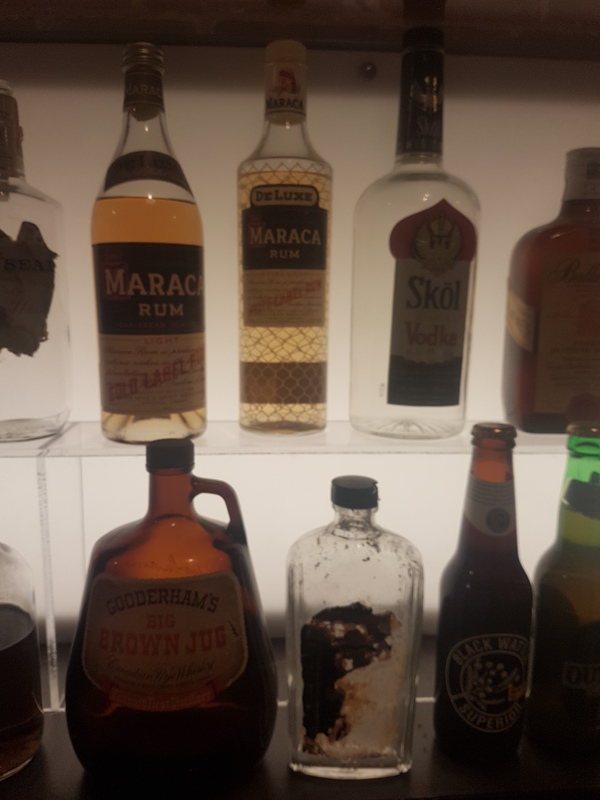 A nice collection of loaned artefacts offer some physical connections to The Ward. 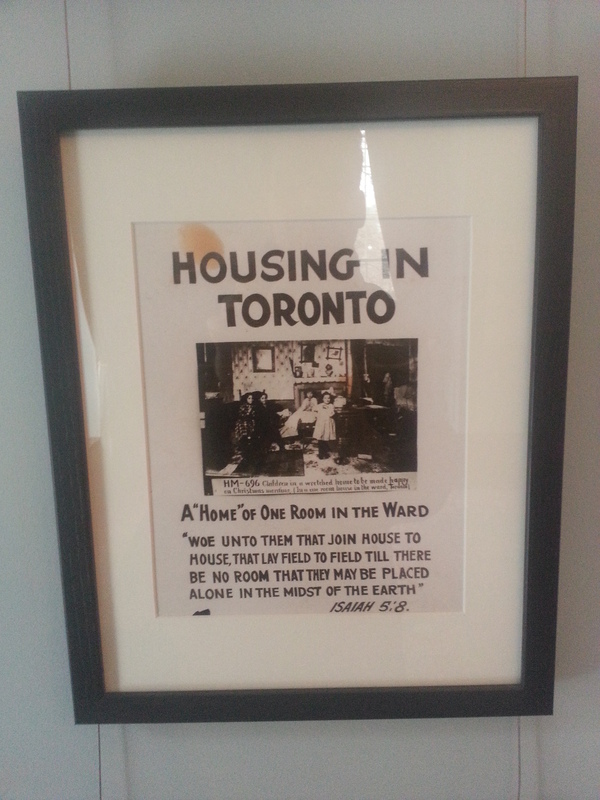 They include a labour union banner, restaurant items and Eaton’s pins, and a copy of the (in)famous 1911 Hastings Report in which Toronto’s medical officer of health, Dr. Charles Hastings, observed and critiqued the overcrowded, ‘diseased’ conditions of the enclave. 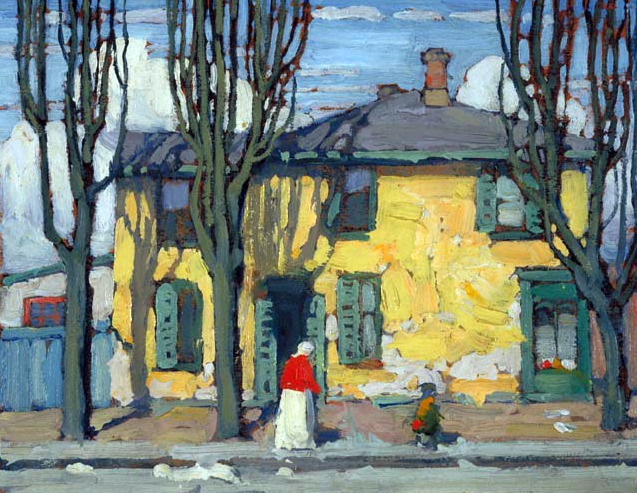 Slums were not a good look for Toronto, according to the high-ranking civil servant. The report came to be the official representation of The Ward. 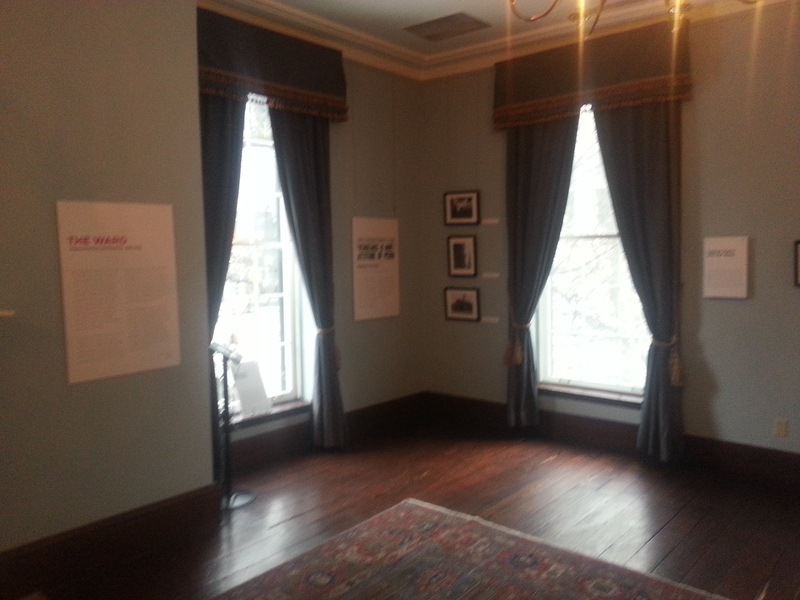 The neatest addition for me, though, was the collection of oral histories from surviving members of the neighbourhood. “The Voices of The Ward” offer different realities than the Hastings Report — one that emphasizes its deep community. Stories include the ethnically diverse clientele of its shops, being an Italian during the War, and how Eaton’s would not hire Italians. The interviews provide an audible, human element to The Ward in a way that faces in pictures or names in old news articles cannot. Archival images and words are certainly great resources, but they can put history at a distance. 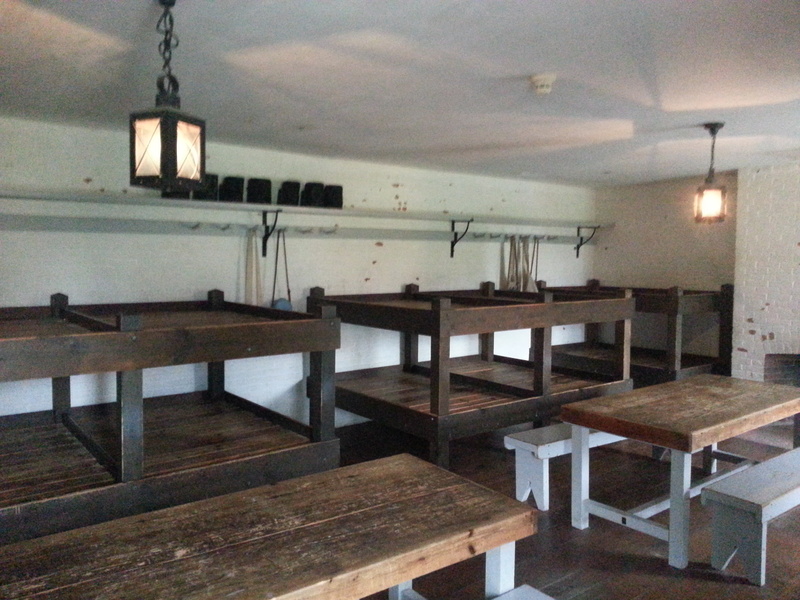 The recordings are a very important reminder that there are living connections to St. John’s Ward today. After all, 1950 wasn’t that long ago in the grand scheme of history. 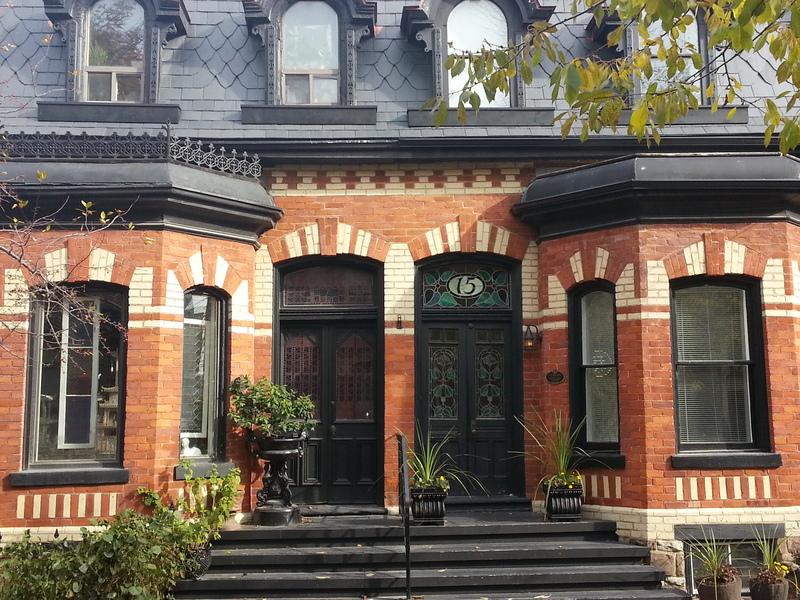 Residents of The Ward and their descendants still live in Toronto. 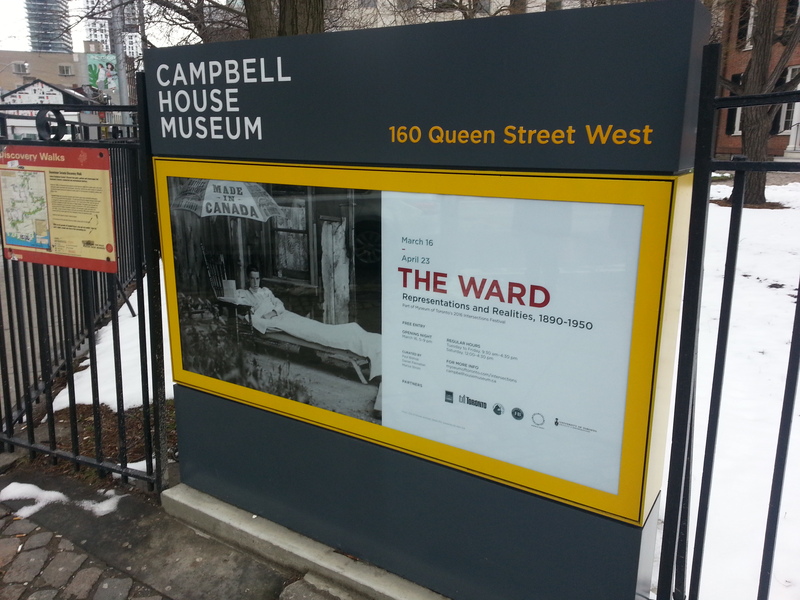 “The Ward: Representations and Realities, 1890-1950” is on until April 23, 2016 at Campbell House Museum at 160 Queen Street West. Admission is free, although donation is always appreciated. As 2015 has come and gone, I think it’s an appropriate exercise to take stock of my year of exploring the city. 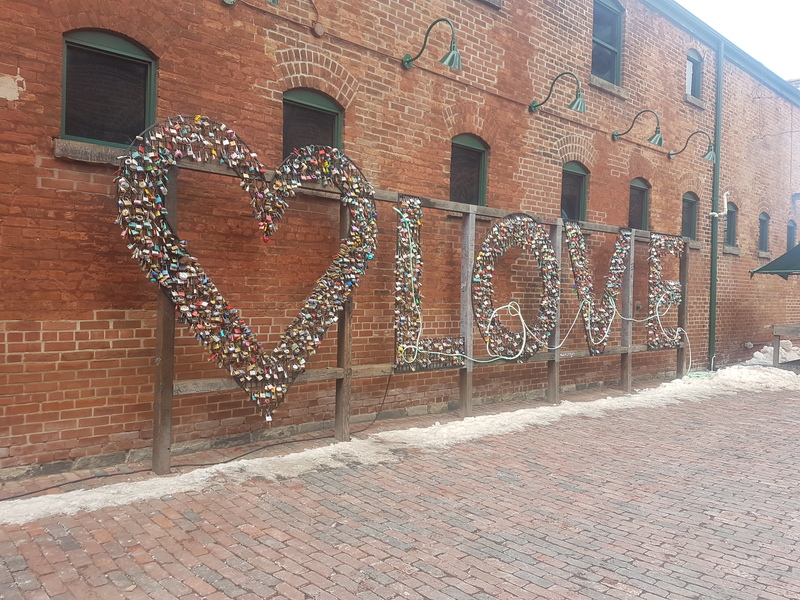 My adventures were concentrated once again within the borders of the Old City of Toronto, which was expected, because even in the context of the MegaCity, Toronto Proper still has many stories to discover and relay. 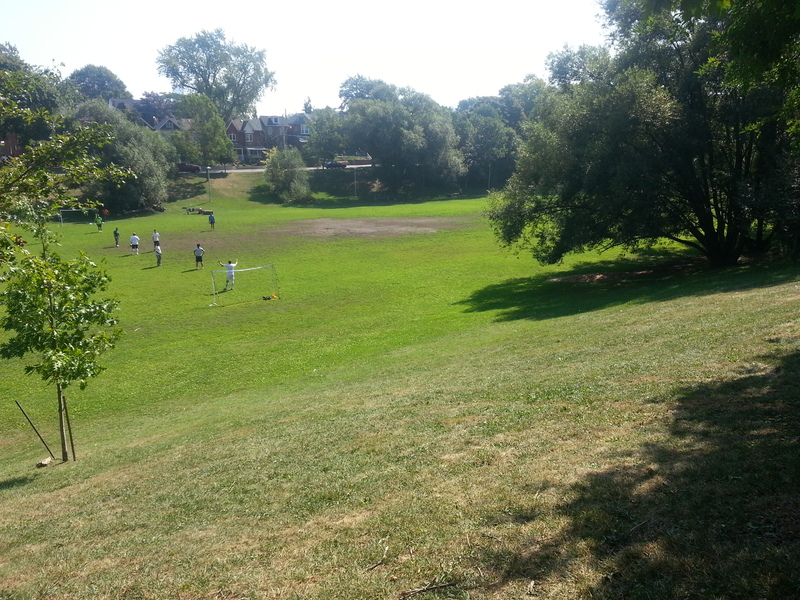 A huge highlight was attempting to peel back of the layers of the Fort York area. 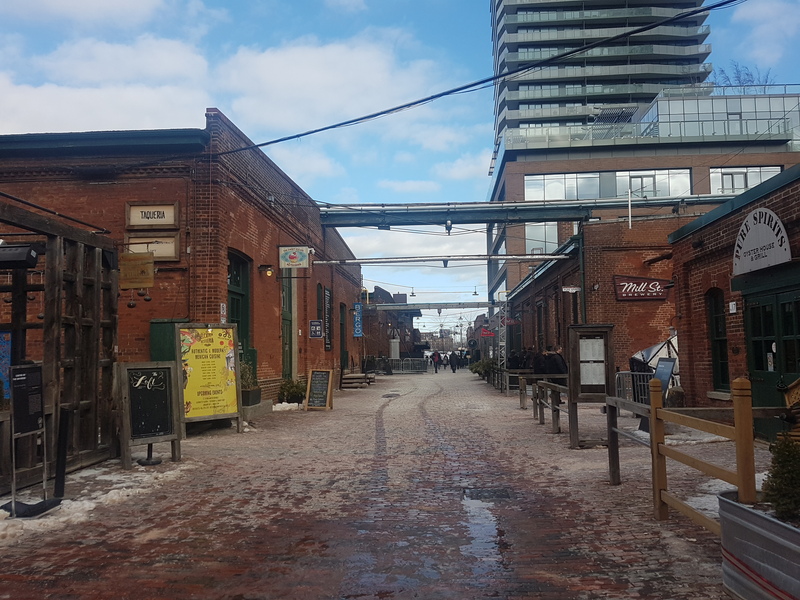 For an area that has had two hundred years of history and is important in the grand story of Toronto, it’s development into a neighbourhood is only a recent development. 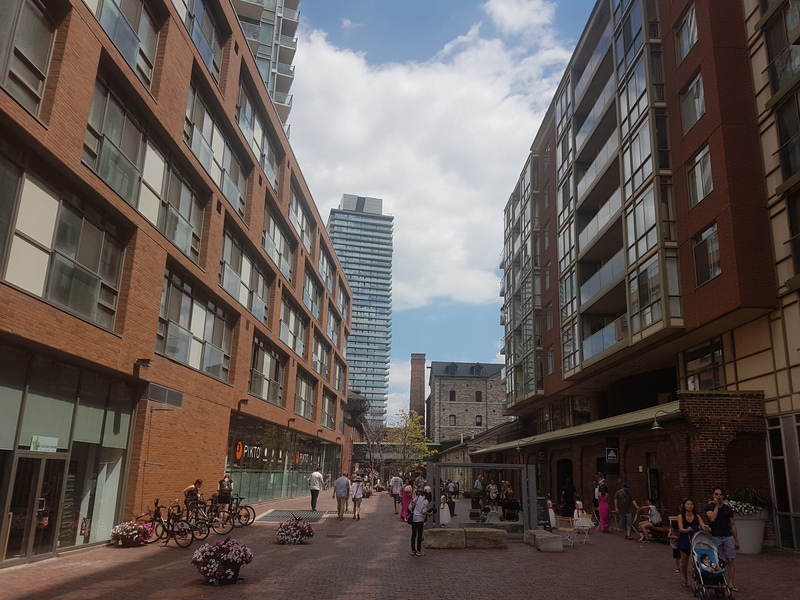 I took a similar approach in meandering through Yorkville, which has been a ‘village’ for more than a hundred years, but has layers of natural, industrial, cultural, and built heritage. 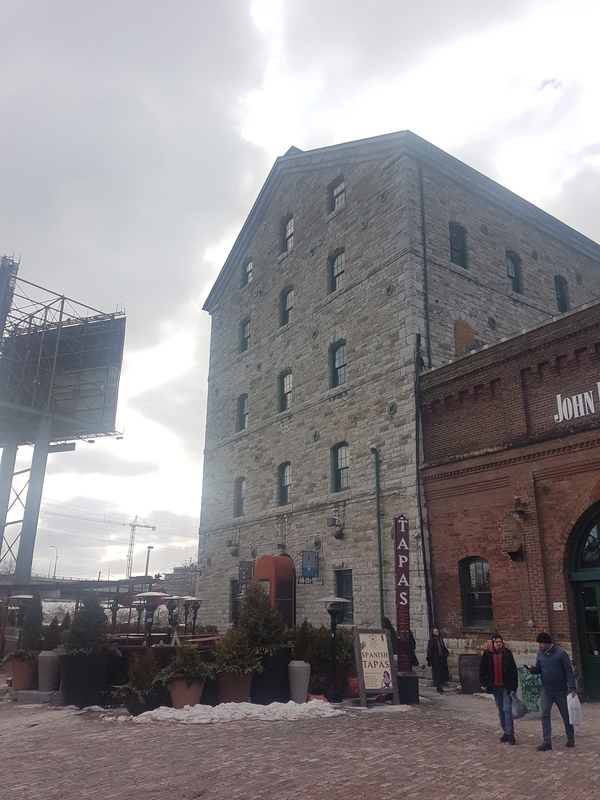 Towards the end of the year, however, I got outside of the downtown core and started to explore areas that were closer to home. 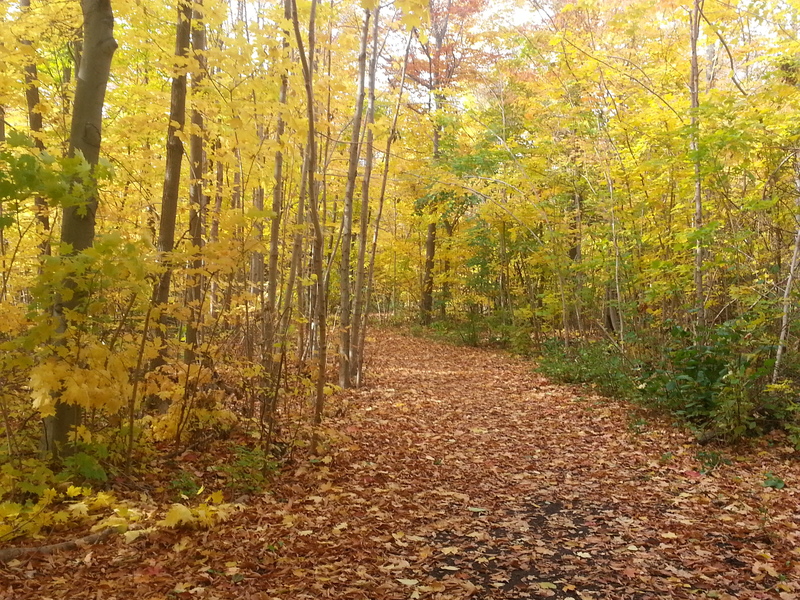 This ultimately began with a guided Heritage Toronto tour through Etobicoke’s Sunnylea, but it really took off with a look into Passmore Forest and then shortly followed by Brimley Woods. 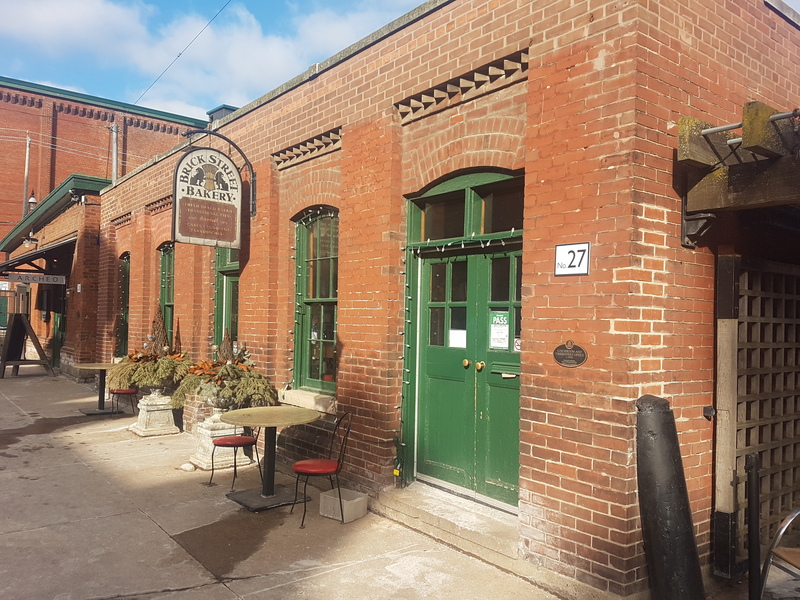 The existence and evolution of these greenspaces and their environs in the context of Scarborough’s farming past and suburban present is fascinating. 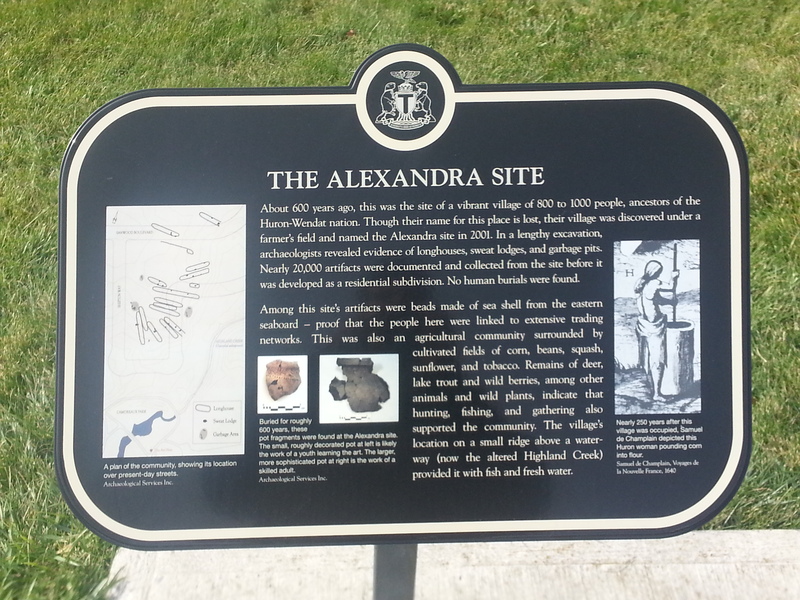 In the case of Passmore Forest, there’s even a pre-contact history with the Alexandra Site! 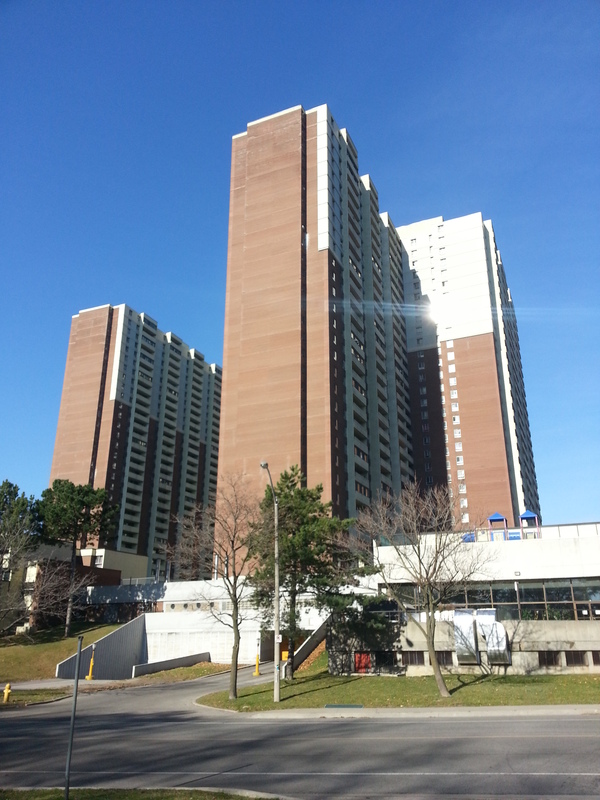 East York’s Crescent Town and North York’s Peanut and environs was a further investigation into suburbia, particularly in the history of tower building in Toronto. 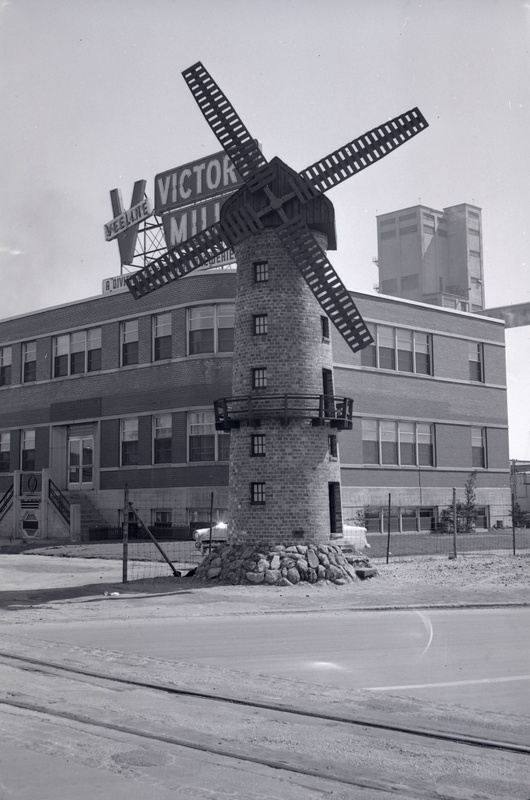 Although located in different parts of the city, both their constructions interestingly necessitated the extension of two main roads – Victoria Park Avenue for Crescent Town and Don Mills Road in The Peanut and area. 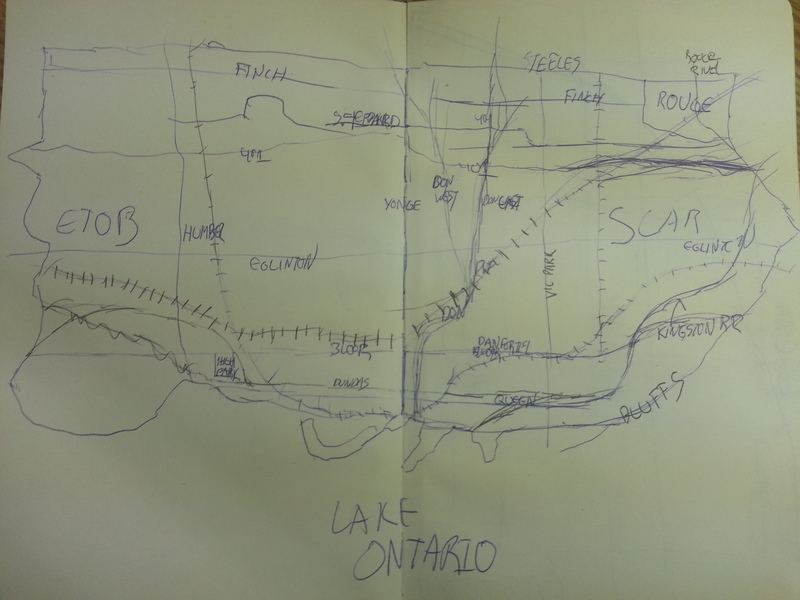 In regards to where I’ve been, in June I attempted to draw out Toronto from memory. In constructing this mental map, I identified the holes in my concept of the city. More than half a year later, the western reaches of the city still draw blanks. A resolution for 2016, perhaps? 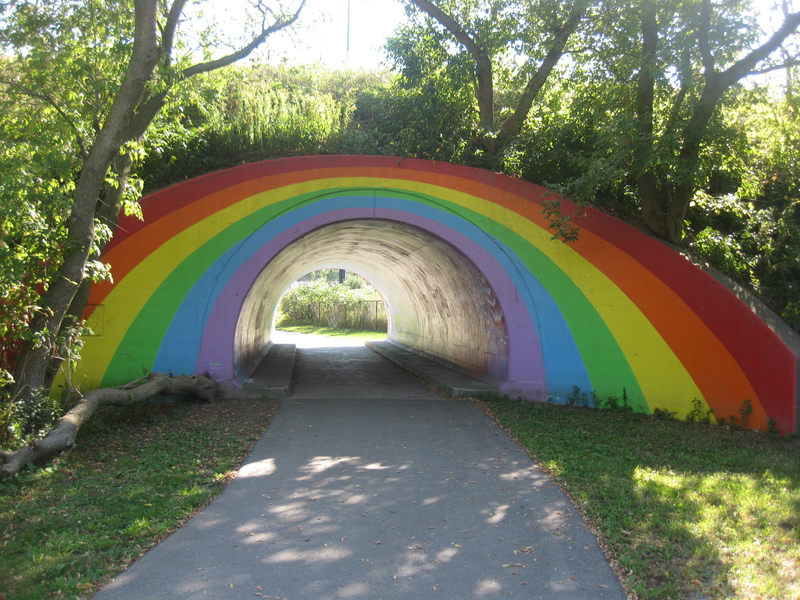 In sum, I’ve been through a bunch of parks, attended festivals, visited areas I’ve known about for a while but never been to (hello Rainbow tunnel! 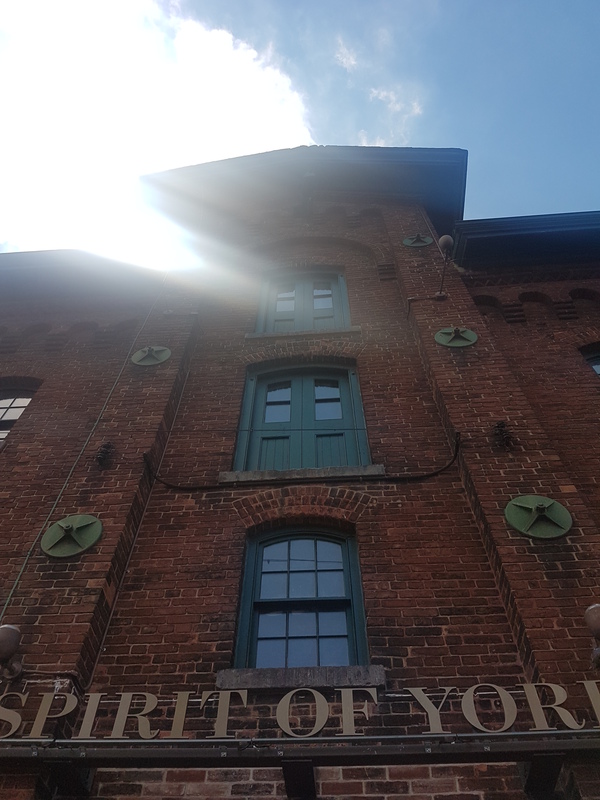 ), got very interested in the transformative effect and influence of Eaton’s on the physical form of Toronto, and most importantly, nerded out about my city. Here’s to more of that in 2016! 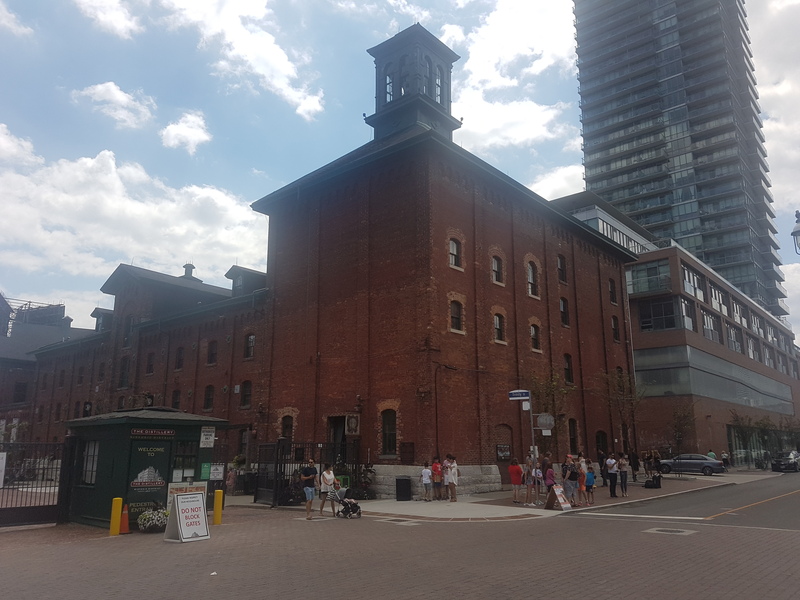 The Fort York area has some of the oldest built heritage in the city, but also has some of the newest real estate as well. 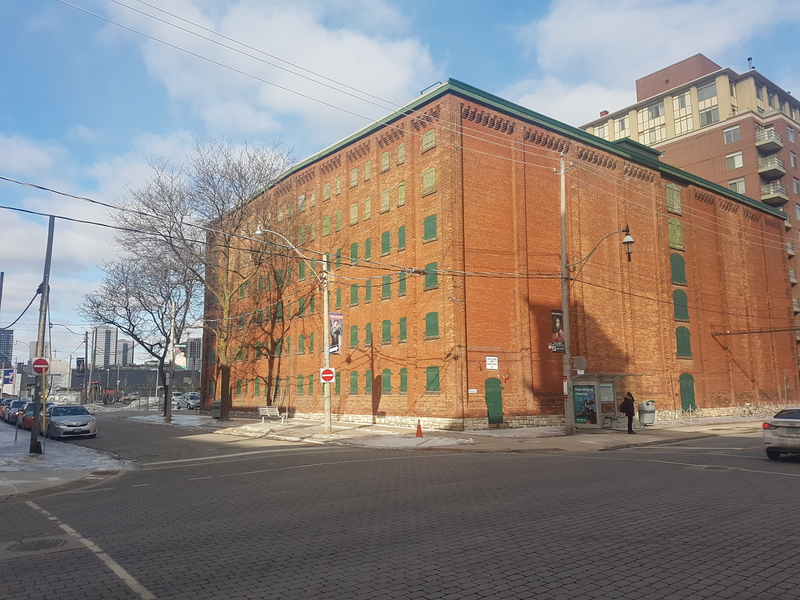 And as much as its history is some of the deepest in the city, its emergence as a neighbourhood – as in, the Fort York neighbourhood or Garrison – is only a recent development. 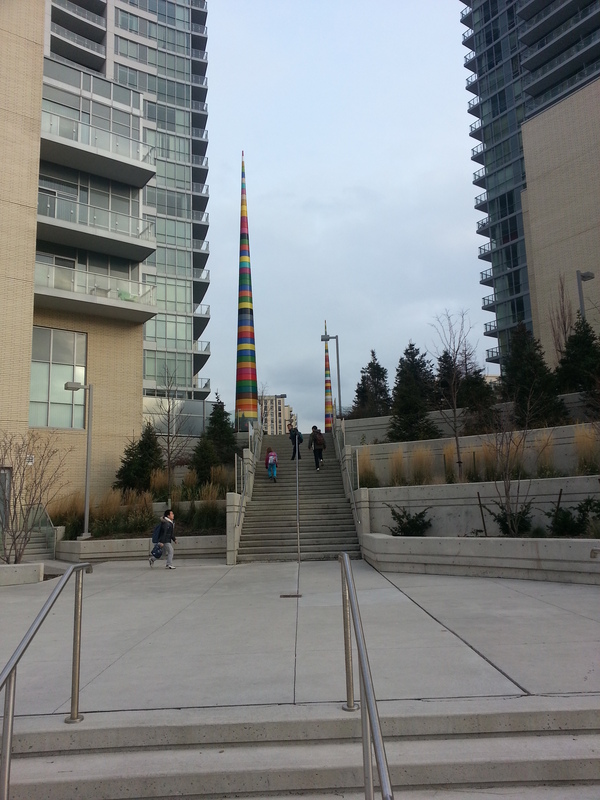 I begin at Bathurst and Fort York. Across the way is the KPMB Architects-designed Fort York Library, opened in 2014. It’s been celebrated as some of the best new architecture in the city. It’s also important to the neighbourhood itself given the changes in the area. The wa lk to the Fort is actually quite a long one, considering that I’m technically walking right in front of it. 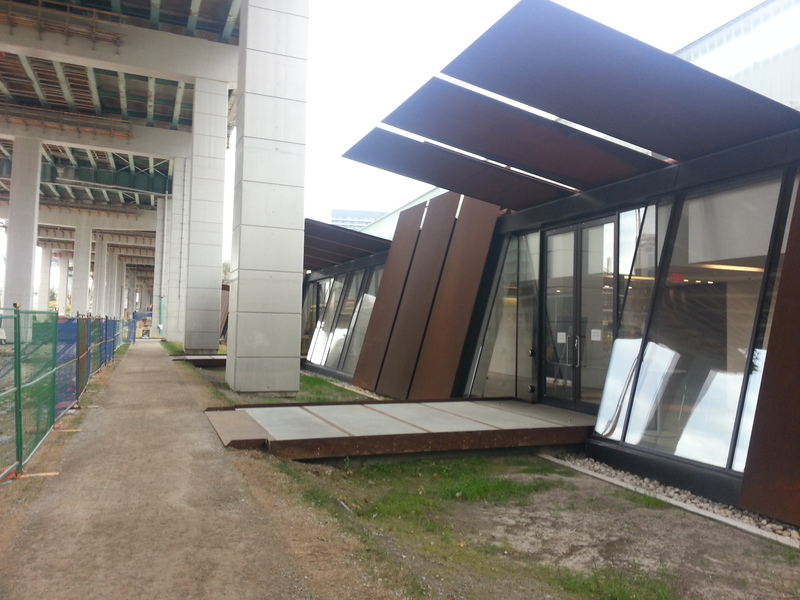 It also passes under the looming Gardiner Expressway, where there’s construction happening. 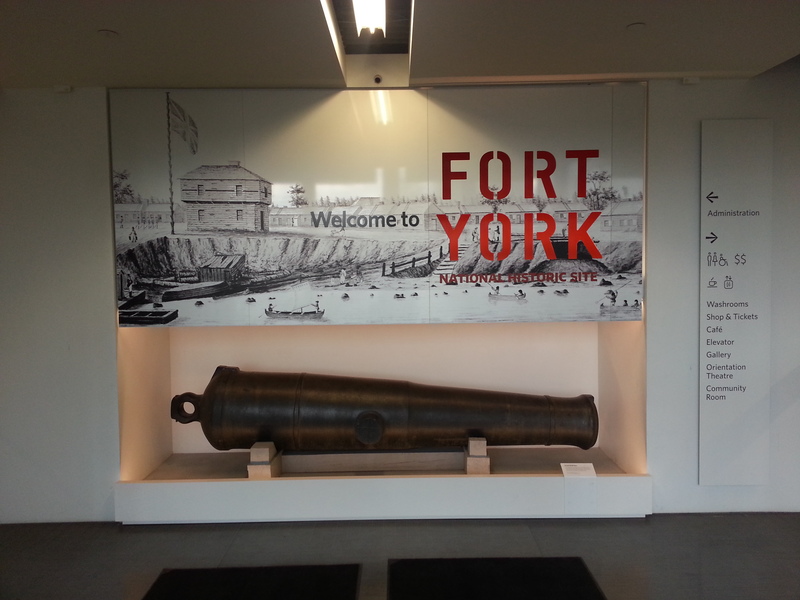 The entrance to Fort York National Historic Site is the Visitor Centre, which wasn’t here the last time I was at the museum several years ago. 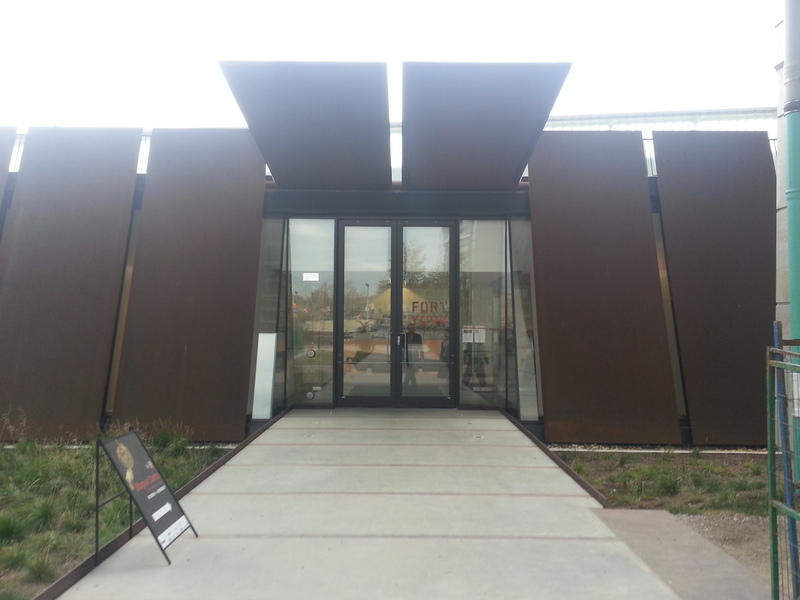 Designed by Patkau Architects and Kearns Mancini Architects, it opened in 2014 to great fanfare and great necessity. The shape of the building is an homage to the bluff that once front the shore of Lake Ontario, which was once located in this spot. 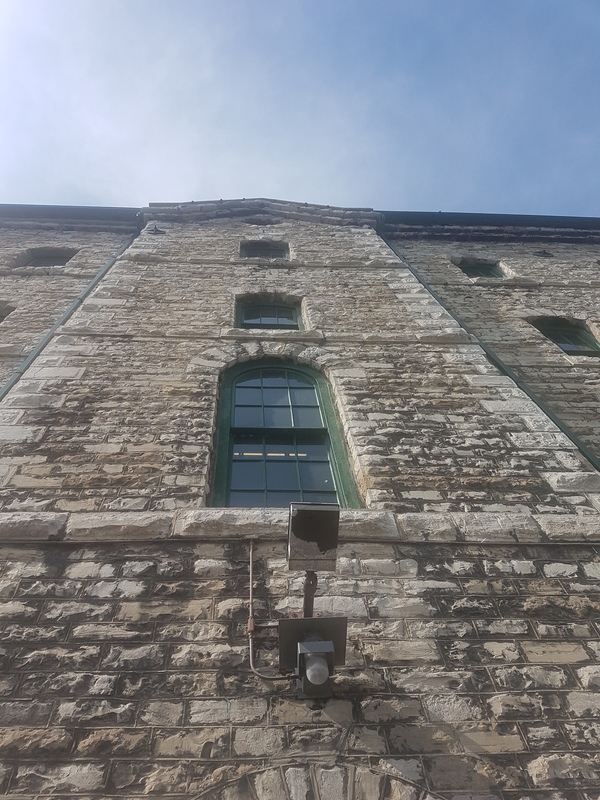 My reason for coming to Fort York is to sample the new Augmented Reality (AR) tour which is in beta testing for the month of October. 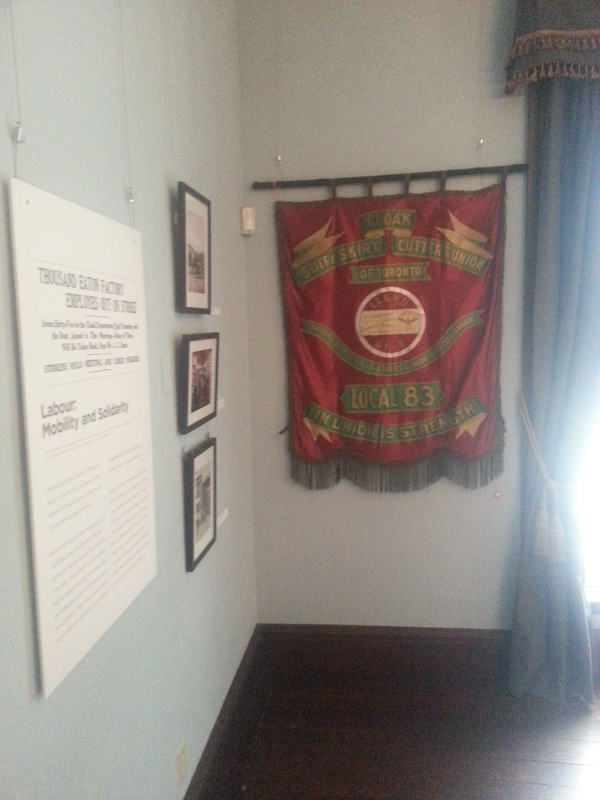 As an educational and interpretation tool, it’s a significant addition for the museum. 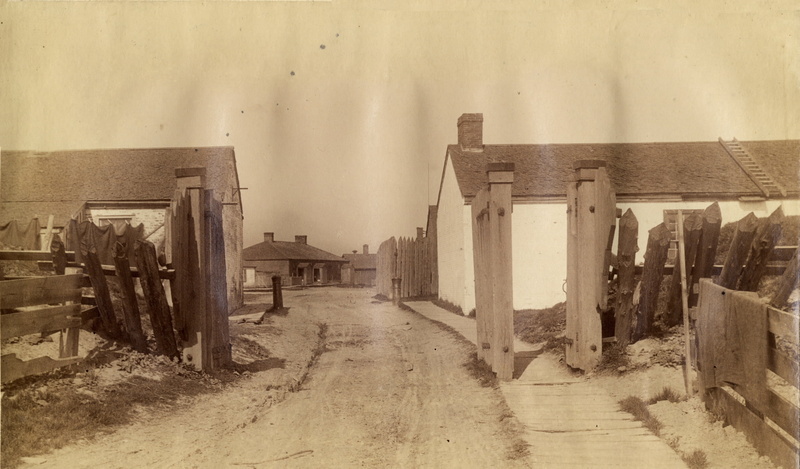 Fort York Western Gate, 1885. Source: Toronto Public Library. 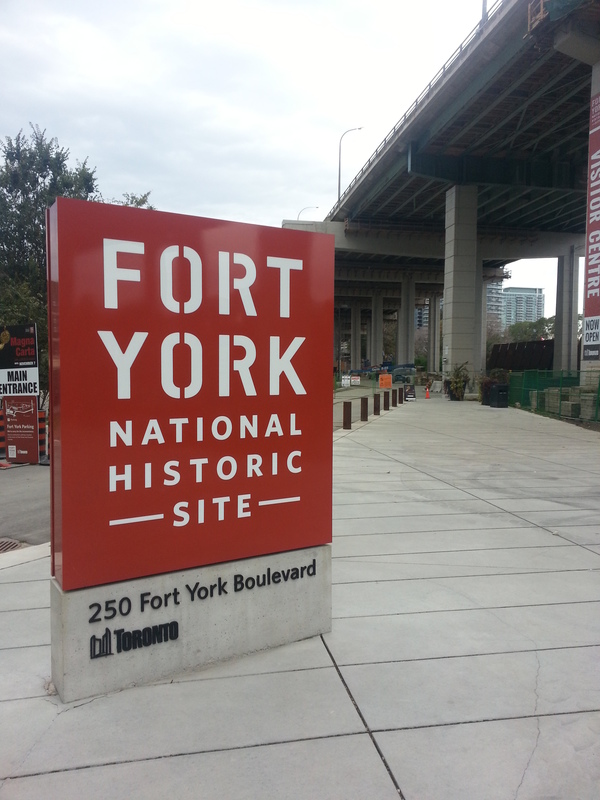 Fort York is the birthplace of Toronto. 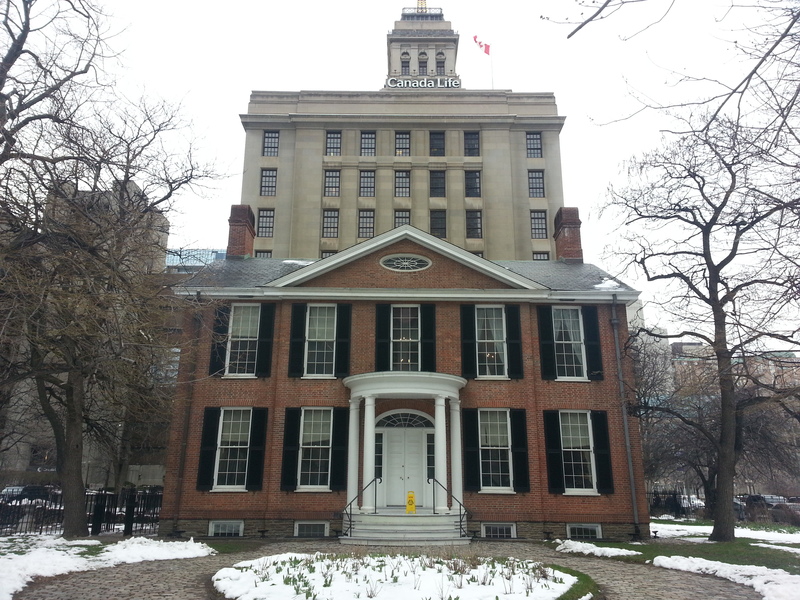 It was founded in 1797, but its buildings date to the War of 1812. 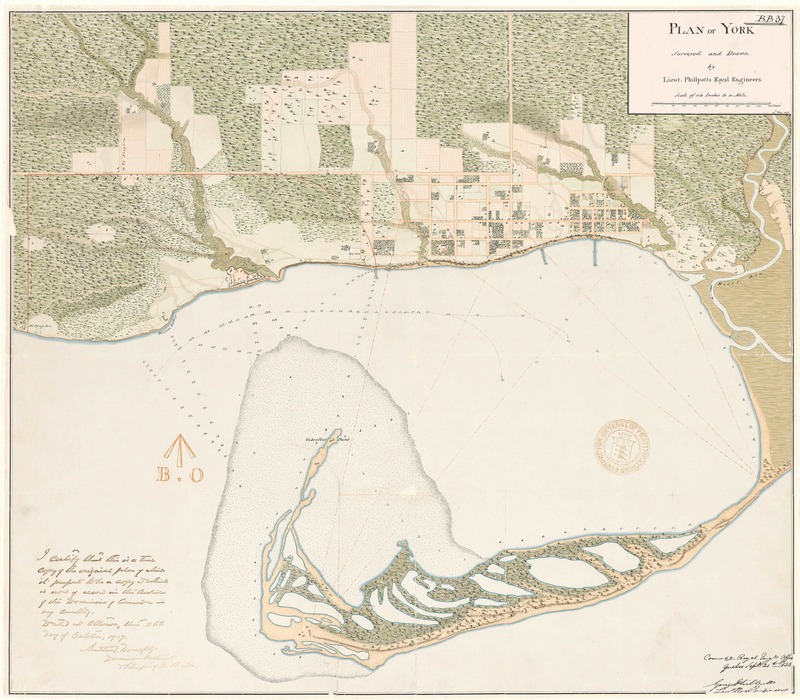 1818 Phillpotts Plan of York. 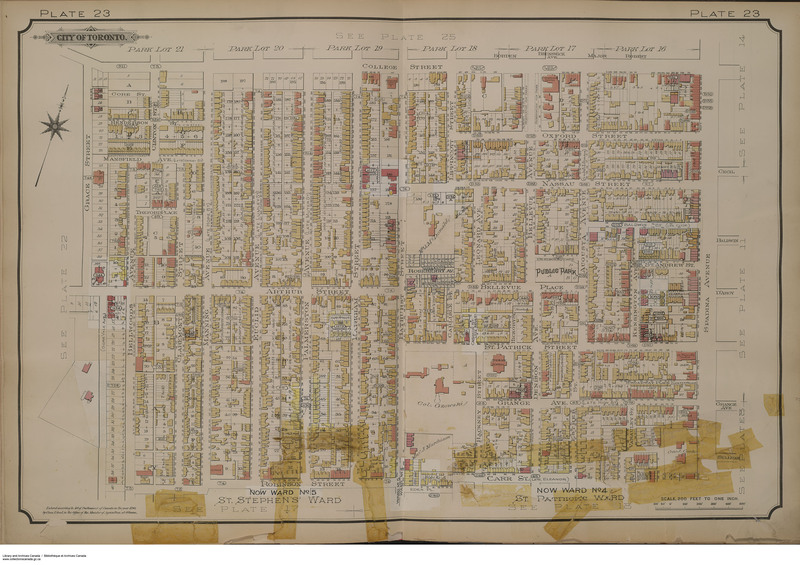 Source: Old Toronto Maps. 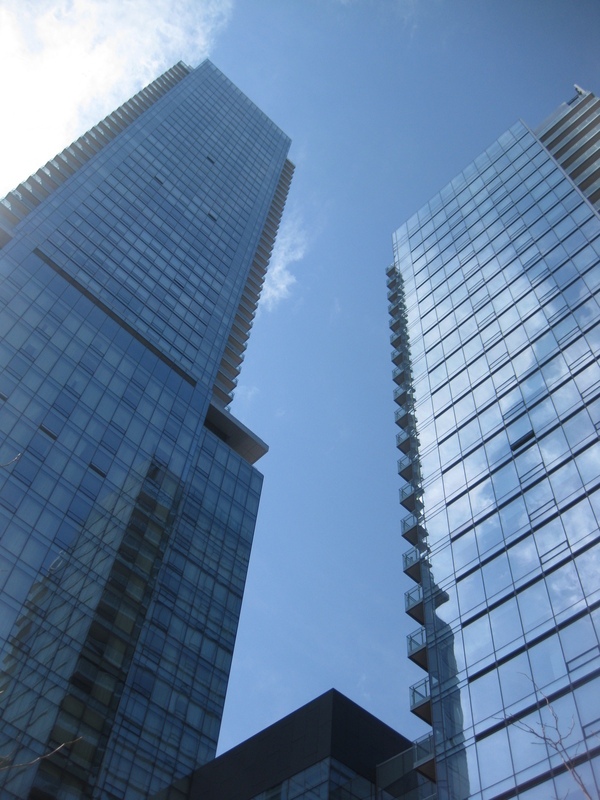 But despite that history, it’s lost a bit of its context given the changes in Toronto over the years. 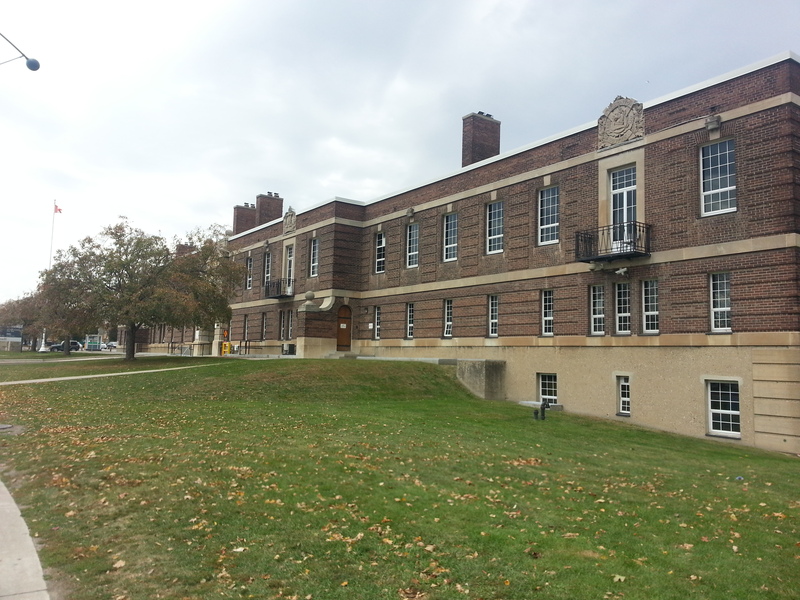 Its historic significance is tied to its geography. The original shoreline, which gave the Fort a strategic location to defend the town of York, is buried under infill. 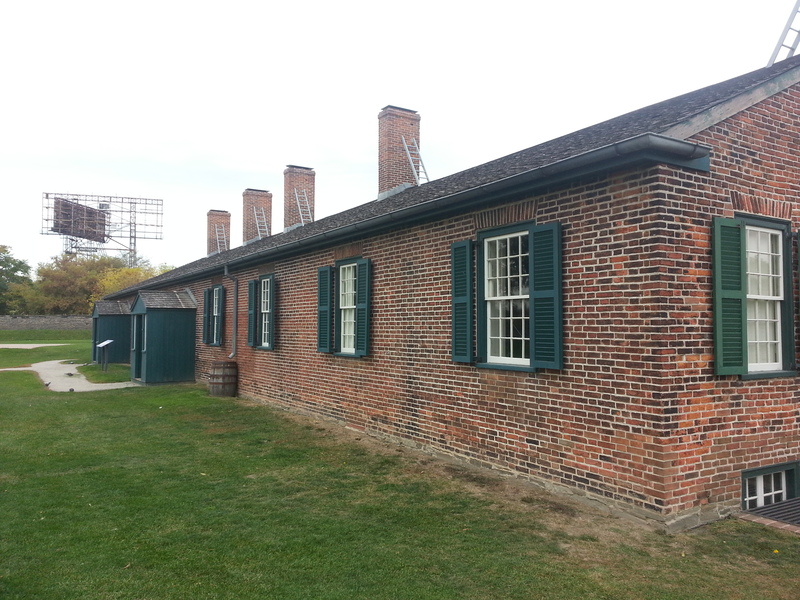 Today, Fort York is landlocked by condos, a highway, and railways. 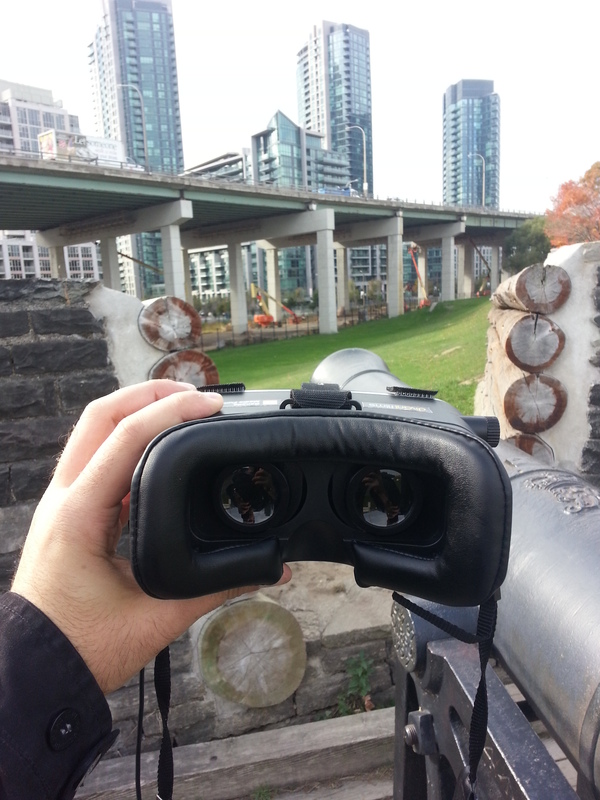 The AR tour recreates Fort York’s historical environment and instills some of the sense of place that’s been lost. It’s powered by GPS and features audio and visual exhibits which are prompted when you enter particular locations. My favourite vignettes were the Battle of York, in which British soldiers blew up the grand magazine killing a lot of invading American troops (including the best named figure in Toronto history: Zebulon Pike). The crater in the grass today is said to be from the explosion. 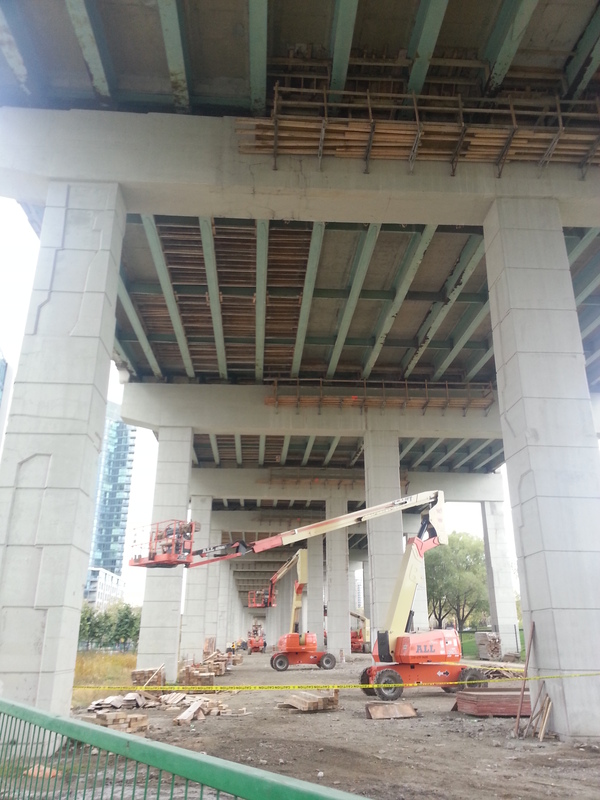 Also, the Gardiner Expressway, which had great audio from the debates of the day. 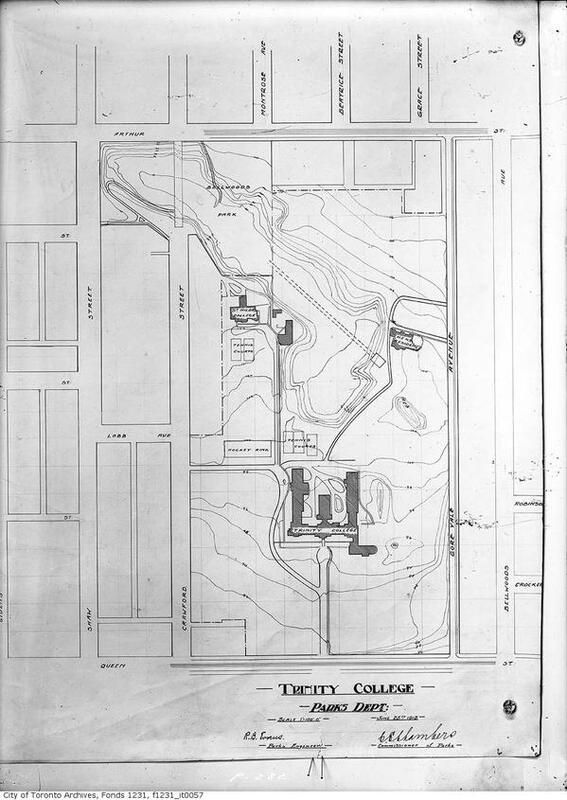 The original proposal for the Gardiner included a plan to route the highway over the Fort. Running it around the site would’ve added eight additional minutes to commuter times (hmm, where have I heard this debate before?). 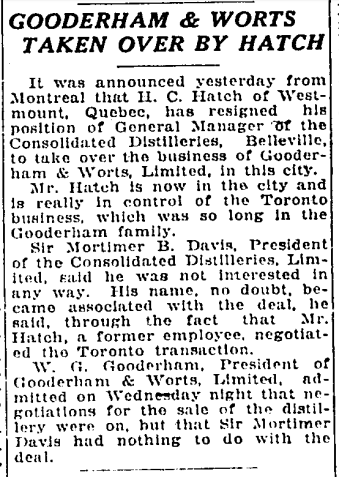 Fort York, 1934. Source: Toronto Public Library. The AR tour is overall a great experience. I was awed by the ability to look around and see the Fort and its surroundings as it once stood. For a museum goer that doesn’t necessary seek a social experience, it’s an excellent way to take in the site. I look forward to seeing it in the museum’s regular programming. 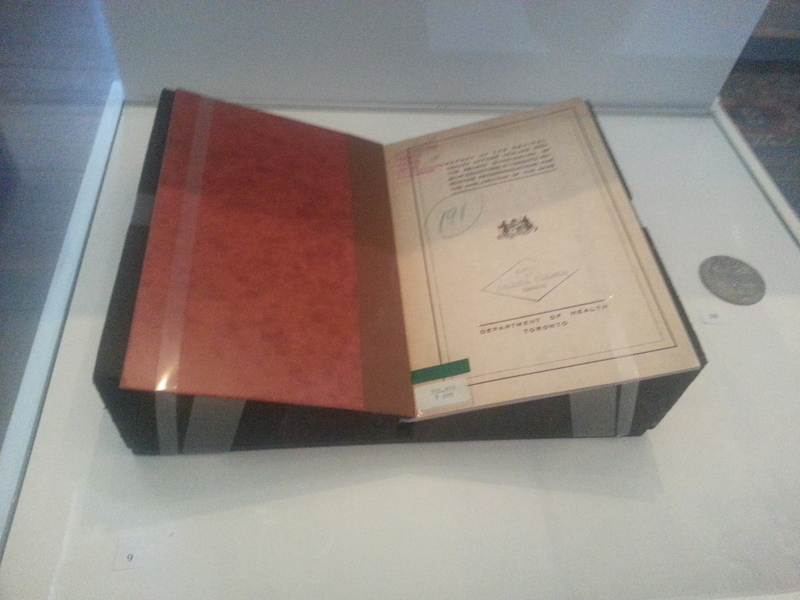 After finishing with Fort, I return back to the Visitor Centre to take in Magna Carta: Law, Liberty, Legacy. 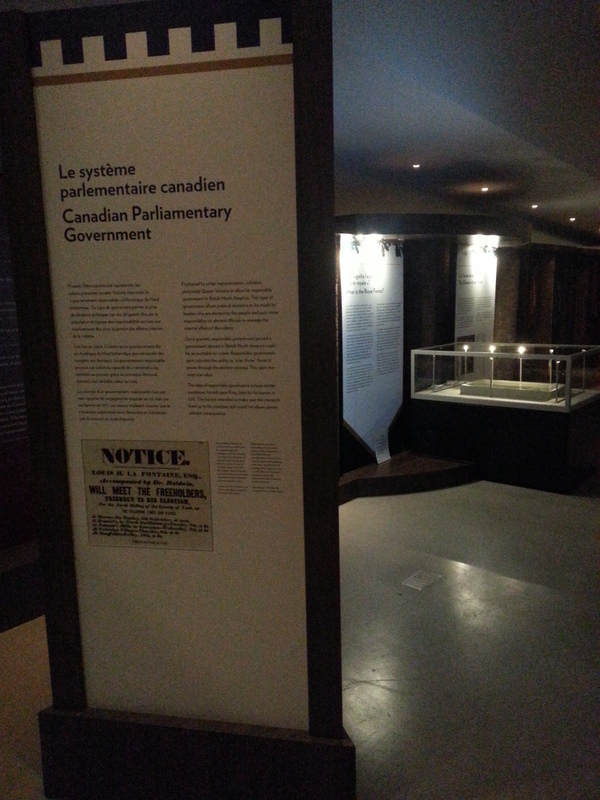 The exhibition is a great mix of didactic and interactive elements, and its messaging is on point. From there, I make my way out of the fort and explore the neighbourhood. 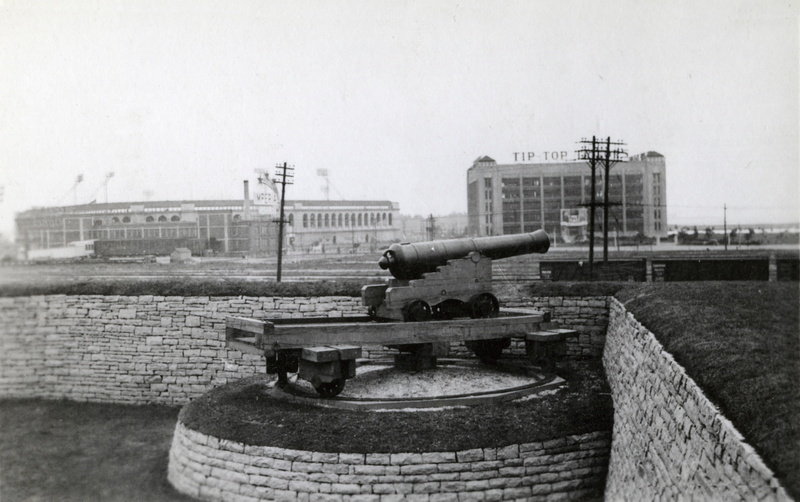 Passing by Garrison Common, which gets forgotten but is a significant part of the site, I come to Fort York Armouries, built here in 1933. 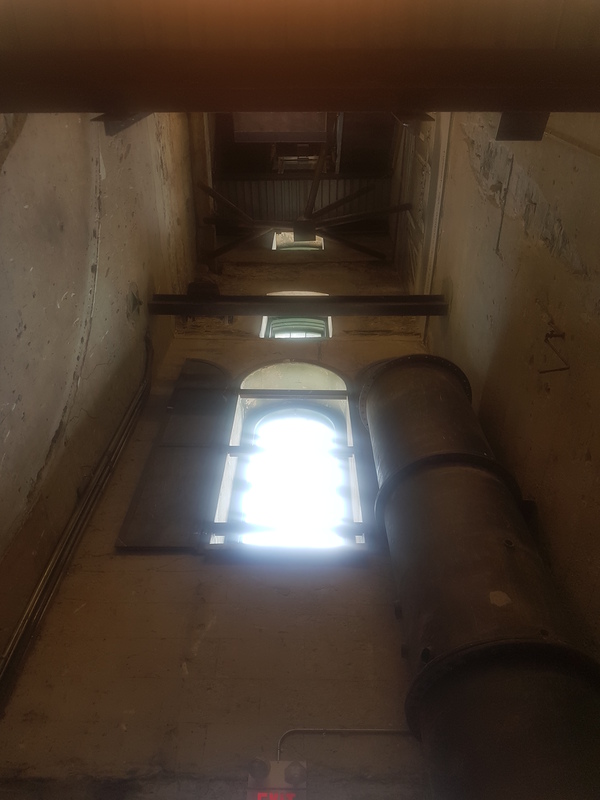 Further down the way is the 1861 Queen’s Wharf Lighthouse. 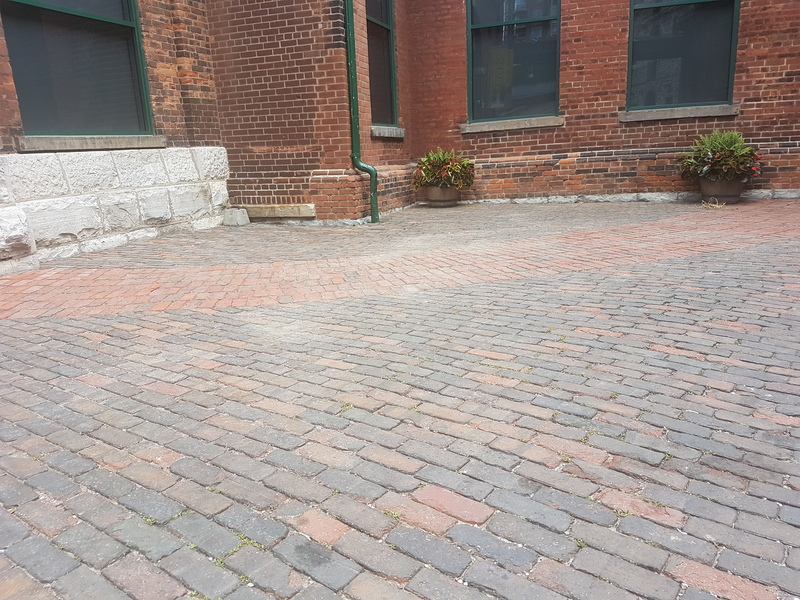 Like Fort York, it’s a bit removed from its historical situation. 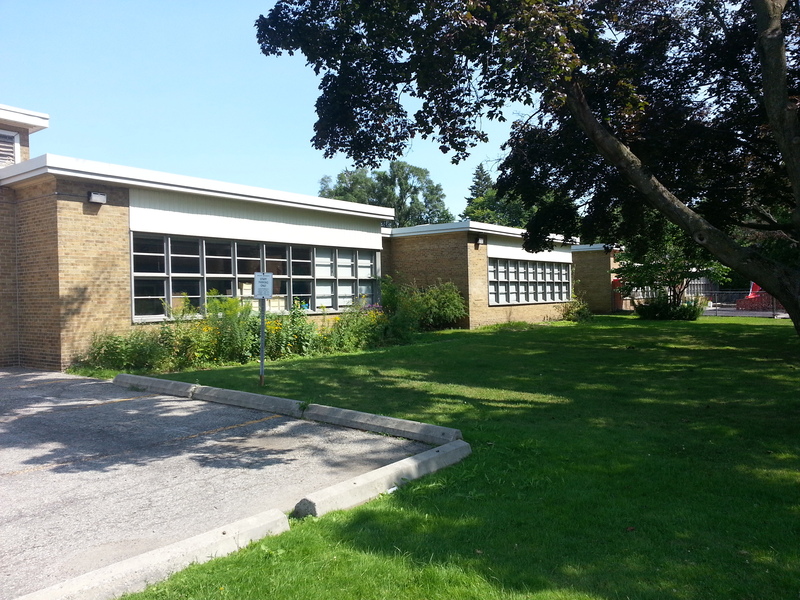 It was moved here in 1929 after infill no longer had it on the water. 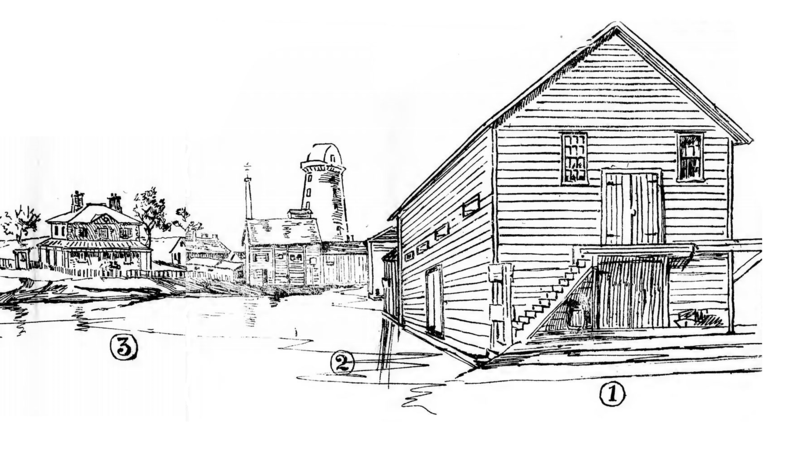 Queen’s Wharf was the location of the recently excavated schooner. 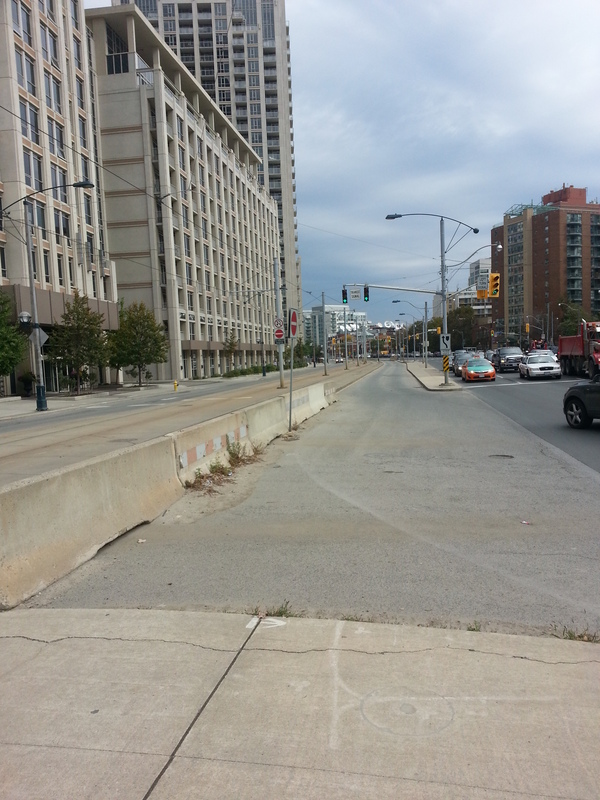 Moving around the weird Fleet Street/Lake Shore Boulevard setup is a pedestrian’s nightmare. There’s car traffic and streetcar tracks to contend with. It’s no wonder the nearby intersection is named one of worst in the city. 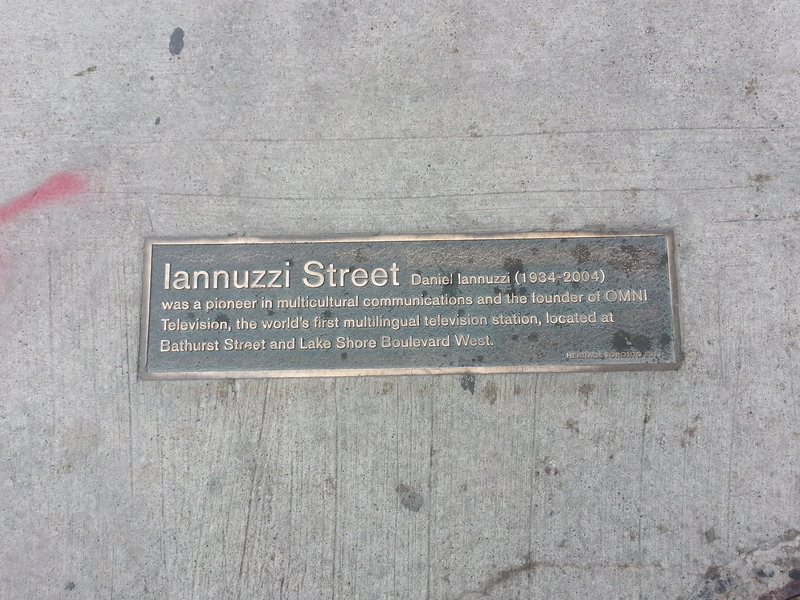 Coming to Grand Magazine Street and Iannuzi Street, there’s markers in the ground honouring their naming. 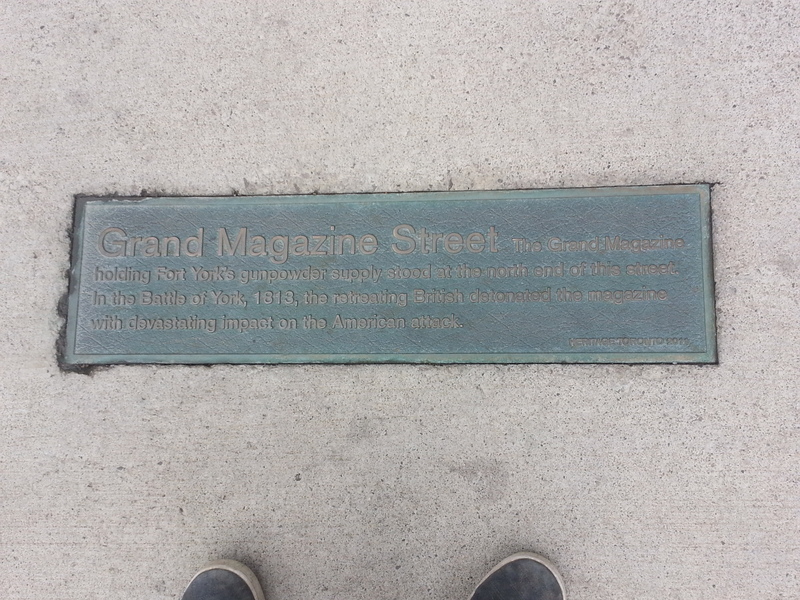 Grand Magazine references the Fort, but Iannuzi refers to the nearby OMNI building and the station’s founder Daniel Iannuzi. I remember when it was just named CFMT. 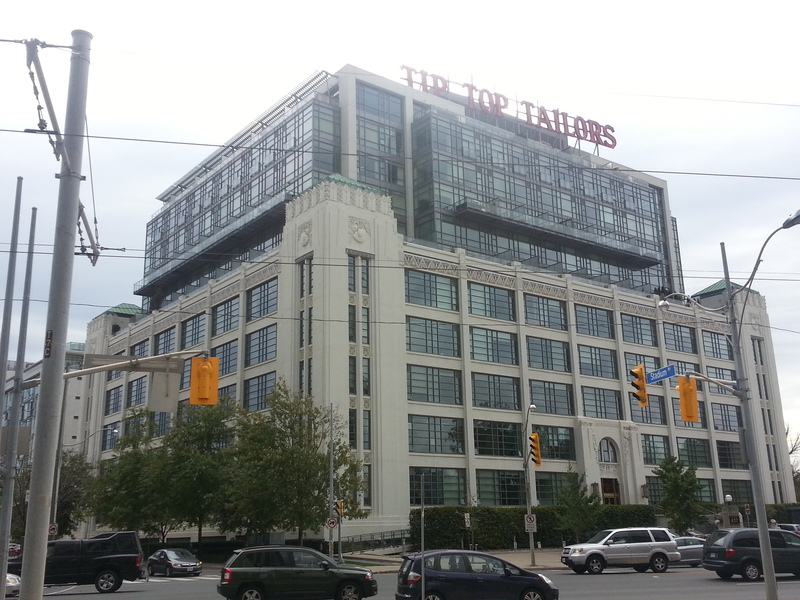 The Tip Top Lofts is a highlight on the street and one of my favourite buildings in the city. 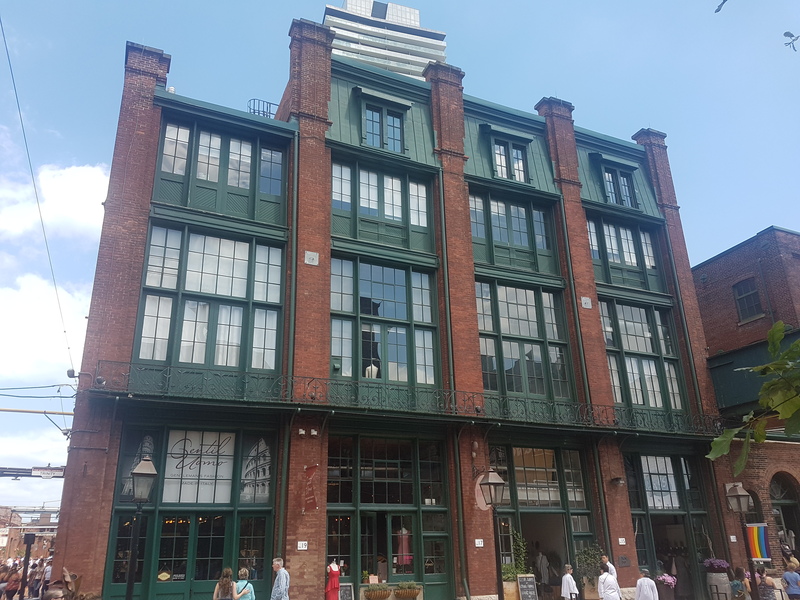 It was originally built here in 1929 as a garment factory. After sitting derelict, it reopened as residences in 2006 with an addition that, in my opinion, works very well with the rest of its Art Deco exterior. 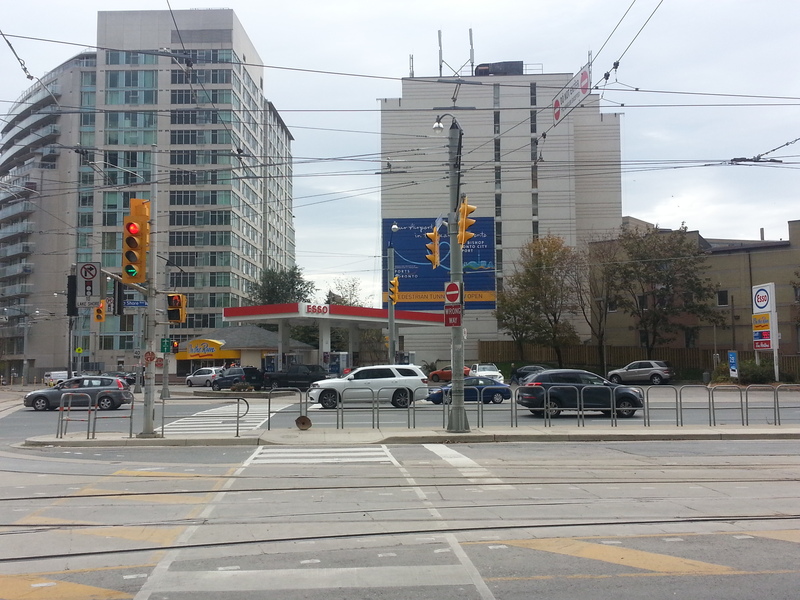 The Bathurst/Lakeshore/Fleet Street intersection is an interesting one for the landmarks that stand here and once stood here. 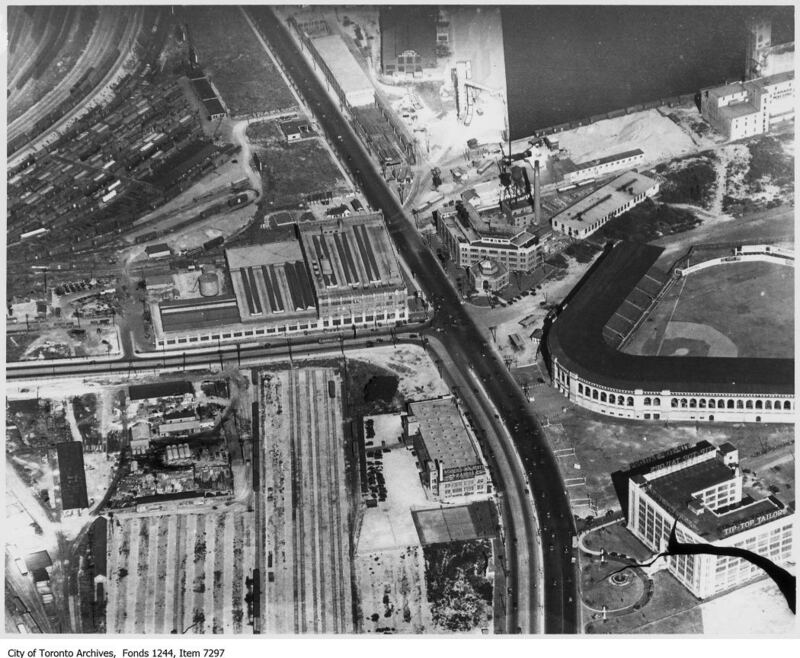 Aerial view of Bathurst Street and Lake Shore Boulevard, 1930s?. 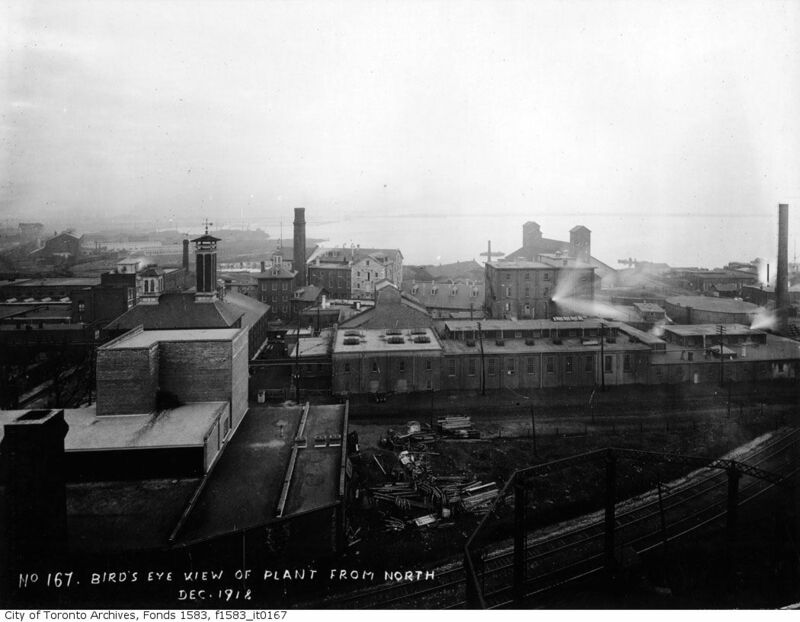 Source: City of Toronto Archives. 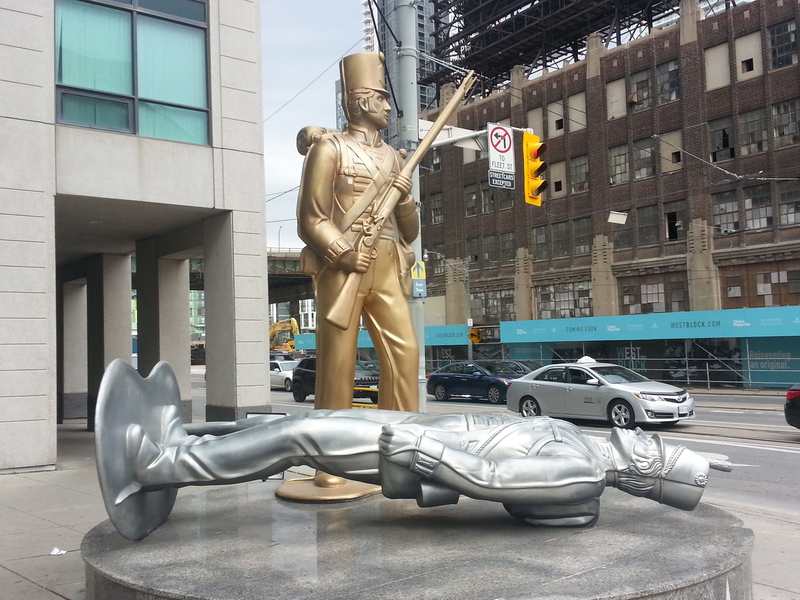 Standing at the northwest corner, there’s Douglas Coupland’s toy soldiers, known as the 2008 Monument to the War of 1812. 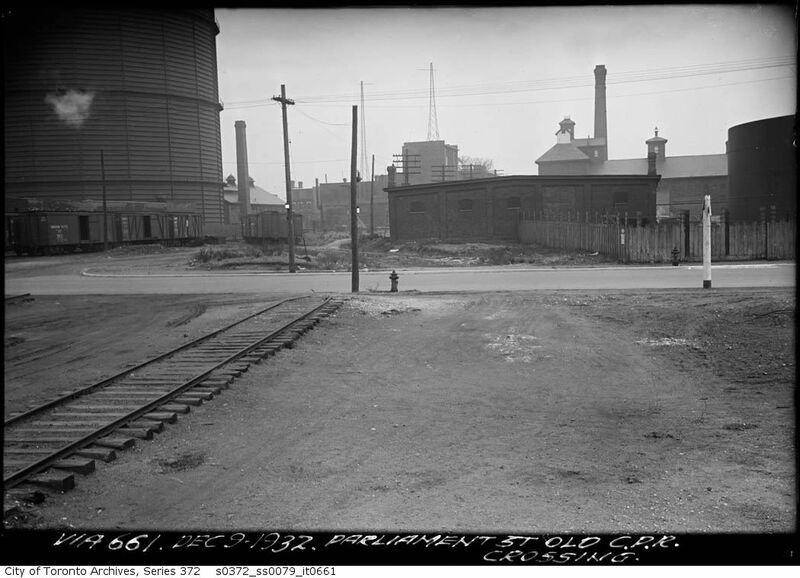 Across the way is a gas station that was once the site of Maple Leaf Stadium, which stood here from 1908 to 1968. It hosted the Toronto Maple Leafs baseball team. 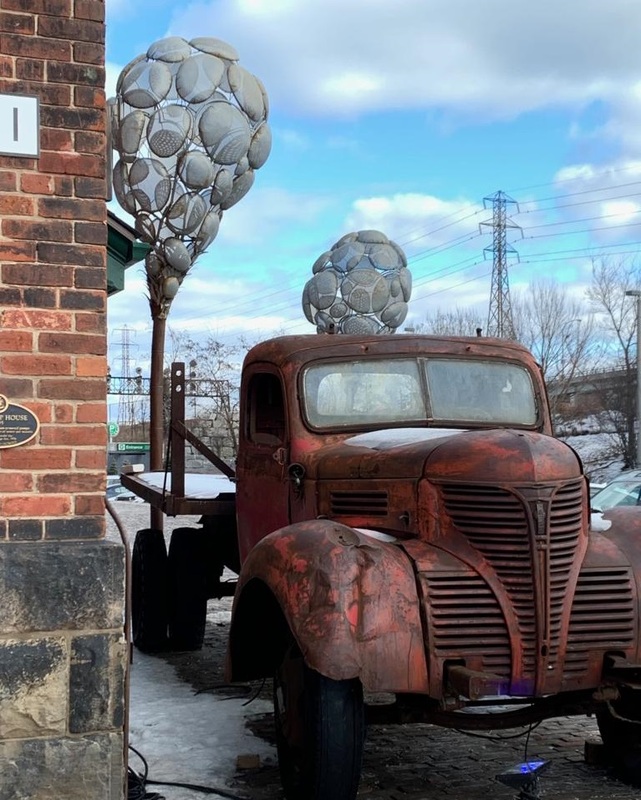 As Adam Bunch tells in his Illustrated History of Baseball in Toronto, it’s one of a couple of lost baseball venues in the city, joining Hanlan’s Point Stadium on the islands and Riverdale’s Sunlight Park. Today, Stadium Road is only remnant of its existence. On the southeast corner is the mentioned OMNI building, known historically as the 1927 Crosse and Blackwell Building. 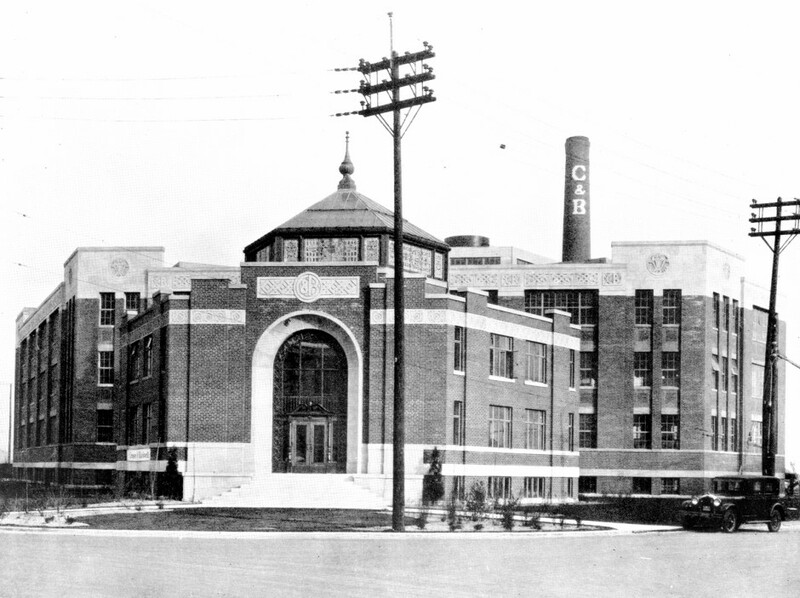 Crosse and Blackwell Building, 1927. Source: Toronto Public Library. 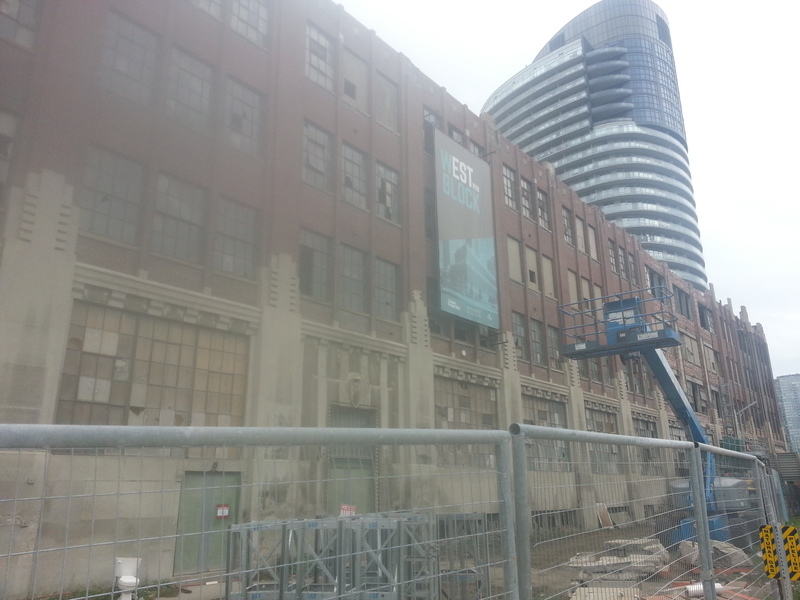 Rounding things out is the landmark Loblaws Groceterias Warehouse, which sadly, has seen better days. A 1927 design by Sparling Martin and Forbes, it completes the Art Deco row happening here on Lake Shore (Carlton Street has another one going too). 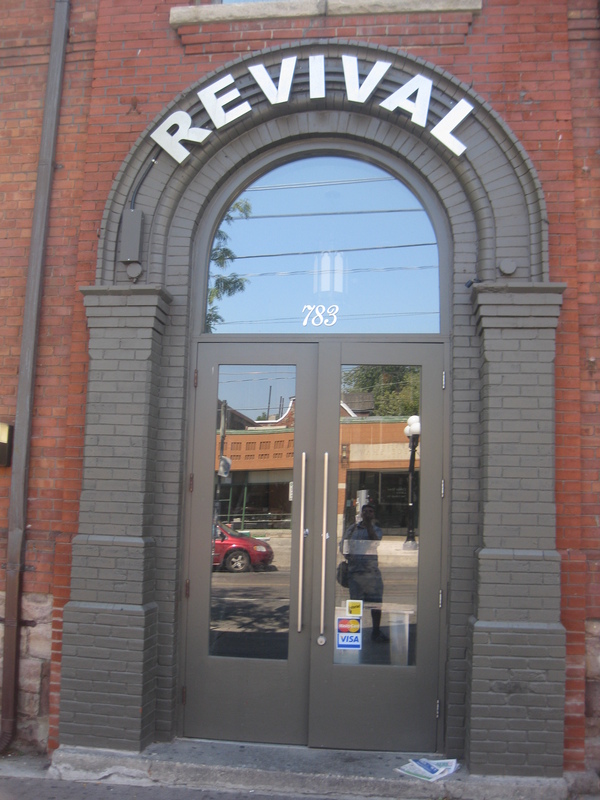 90 years later, ERA architects are going to take their shot at revitalizing the worn out building. 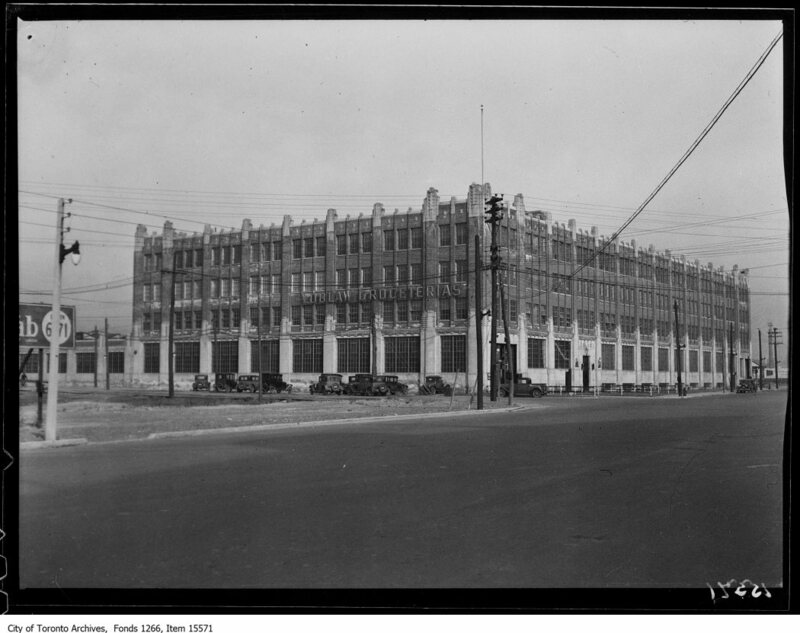 Loblaws Groceterias Warehouse, 1929. Source: Toronto Public Library. Heading east and up onto Dan Leckie Way, the neighbourhood makeover continues. This is CityPlace, whose towers and the amazing Canoe Landing Park disguise the fact that there were once extensive railway lands here. 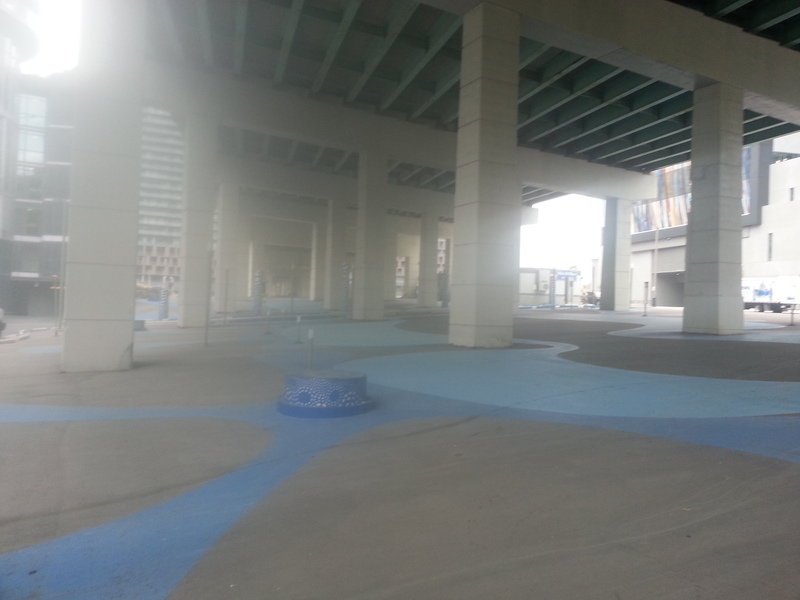 Underneath the Gardiner there’s a park, akin to Underpass Park in the West Don Lands. Speaking of railways, at its head I cross at the Puente de Luz pedestrian bridge. 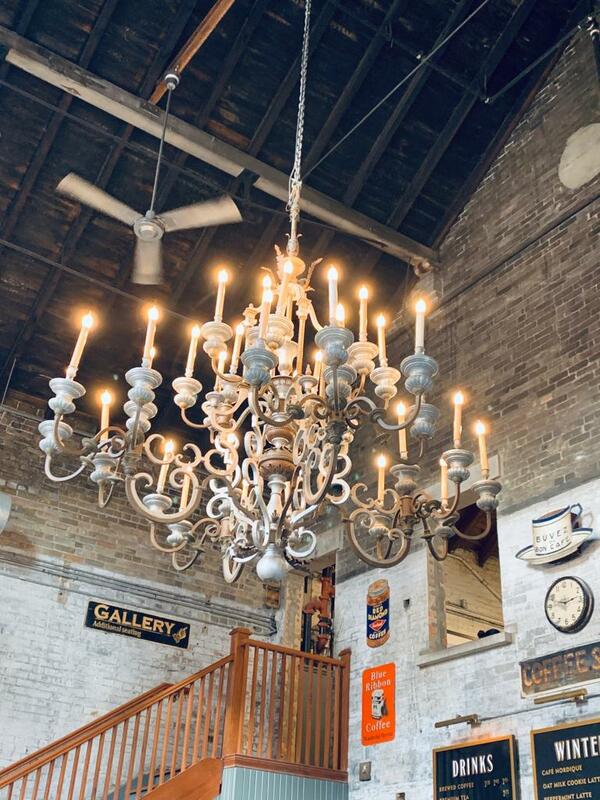 Draper Street is a hidden Victorian gem in the city. Anytime I’m in the area I have to traverse it. Its rowhouses are something else. And there’s a couple of cats that can be found roaming it. 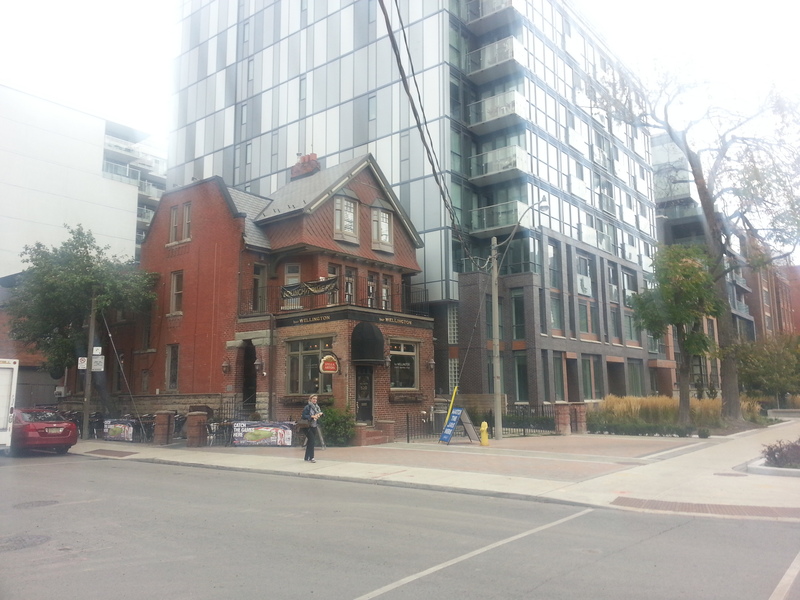 At Wellington & Portland, I like the unexpected juxtaposition between the house-turned-restaurant and the condo beside it. I have to believe there was once a vintage row of homes here, but the present looks pretty nice. 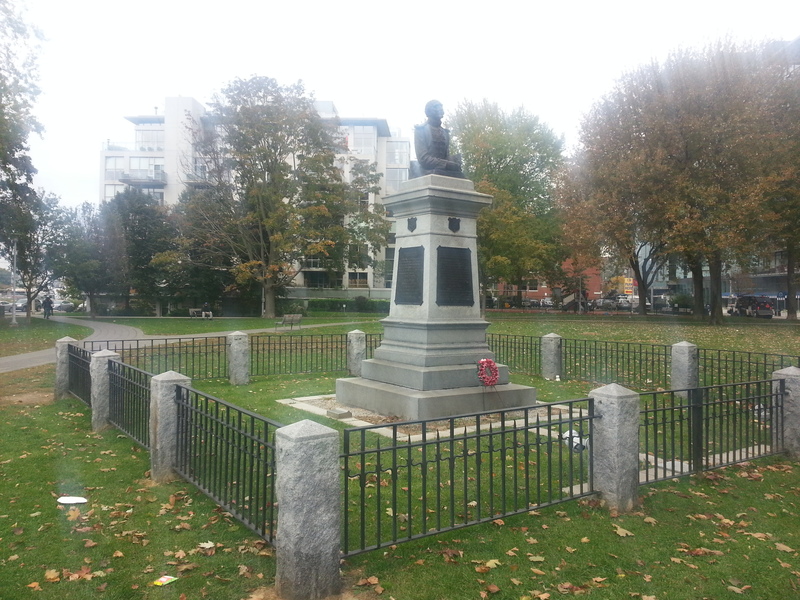 Across the way, Victoria Memorial Square went from yesterday’s military burial ground to today’s quiet park. 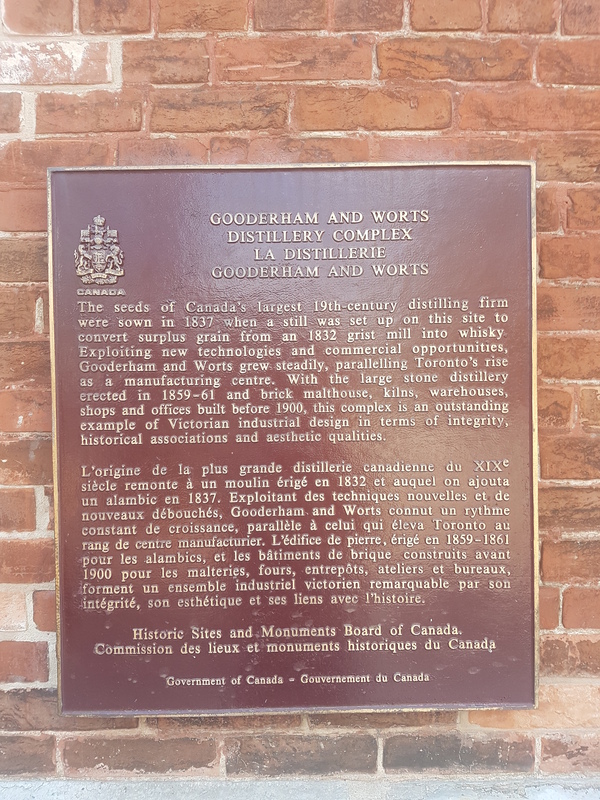 Although geographically disconnected from it, it’s part of Fort York National Historic Site. 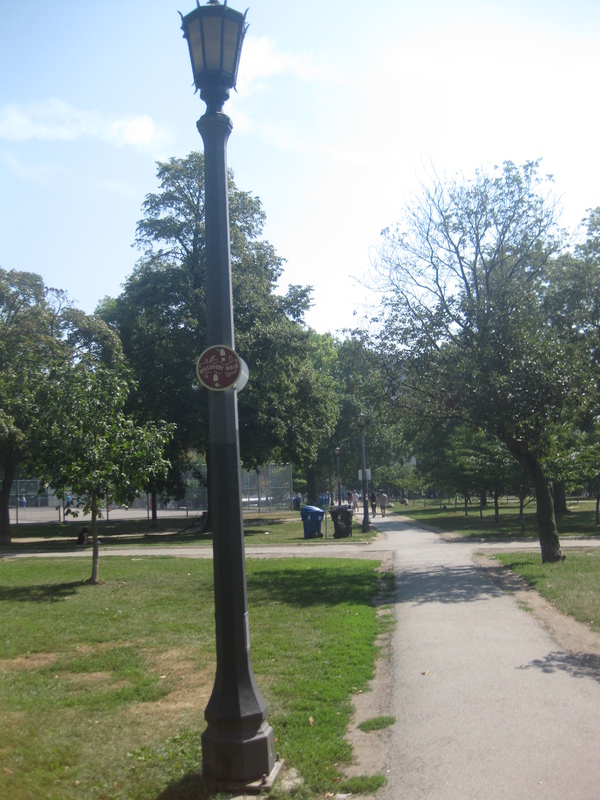 For a deeper read into the park and its history, do read Hiking The GTA’s piece on Victoria Memorial Square. 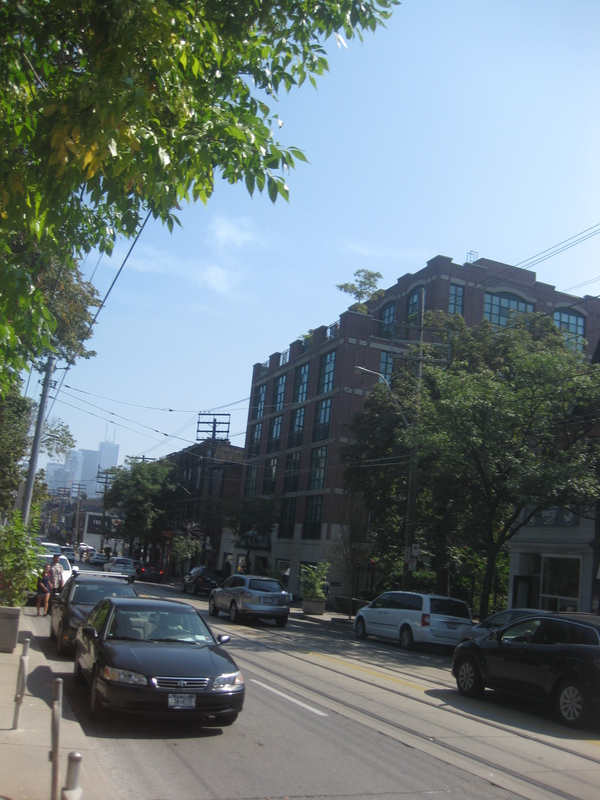 Back on Bathurst, I end my urban hike at King Street. 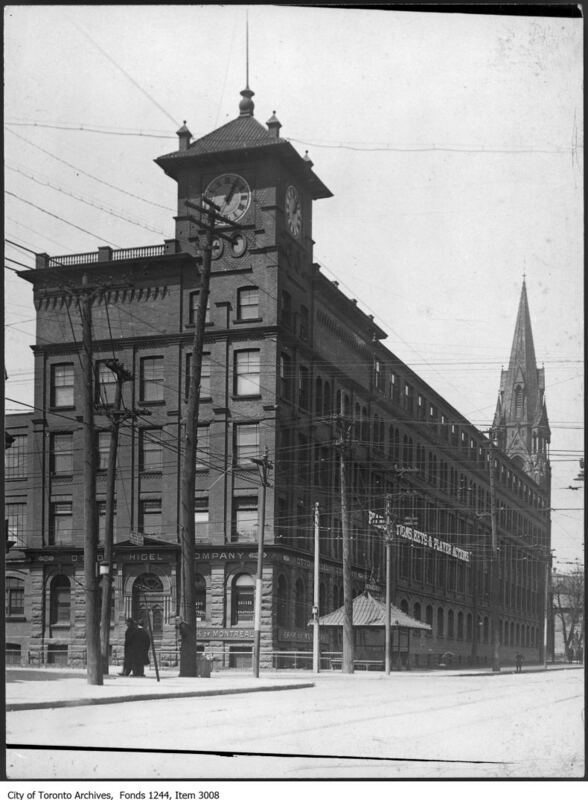 The Otto Higel Piano Co. stood at its northwest corner for the better part of the 20th century before being demolished in 1981. 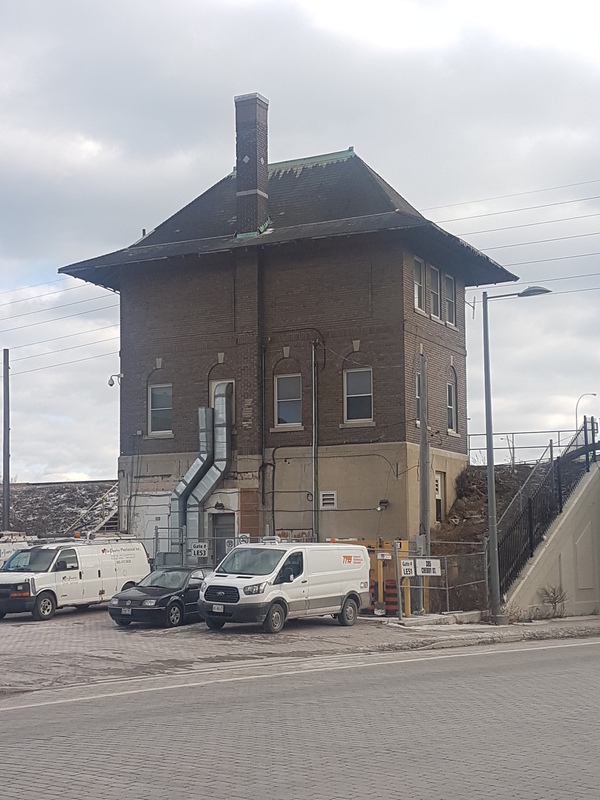 It’s one of my favourite lost industrial buildings in the city, and can’t help but wonder what its use would be today. There’s a Second Cup in its place, which I don’t mind getting a coffee from. Otto Higel Co., 1919. 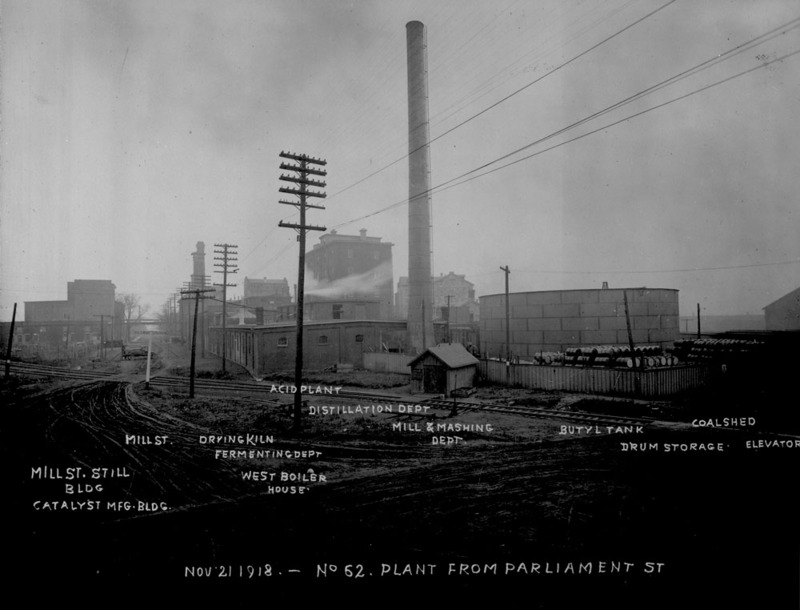 Source: City of Toronto Archives. 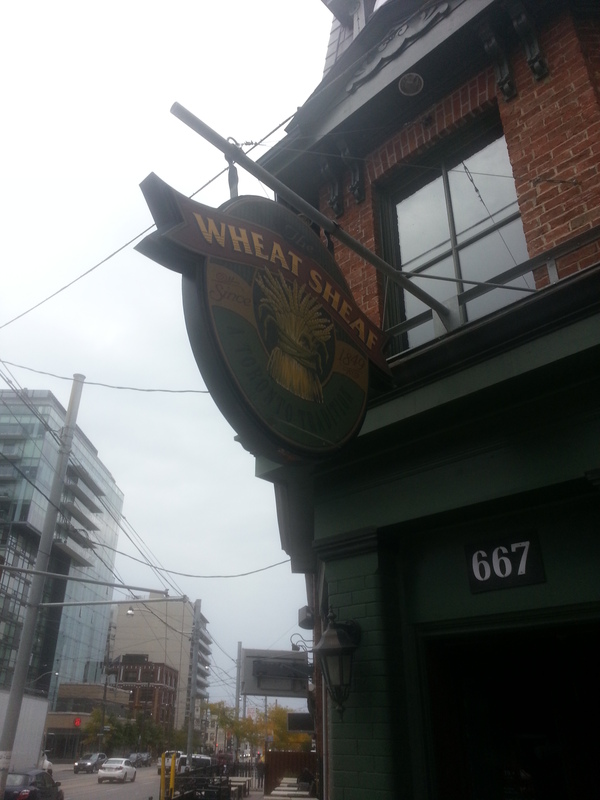 The intersection is also a great bookend for the day because of the Wheat Sheaf, which figures into Fort York and Toronto mythology. Soldiers at the fort were said to have dug a tunnel from the garrison to the watering hole. Great story although not true, sadly! 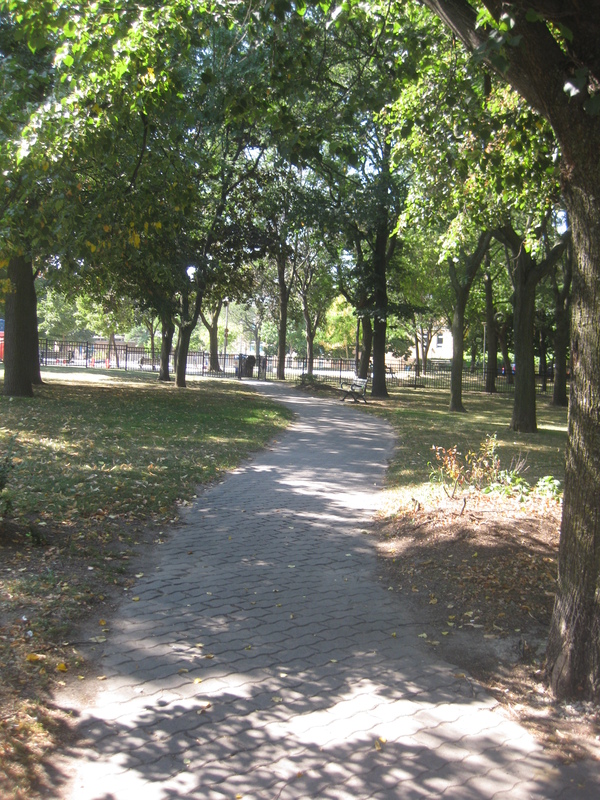 The path of the Garrison bisects streets and runs through parks, joining neighbourhoods like any major throughway in Toronto would today. 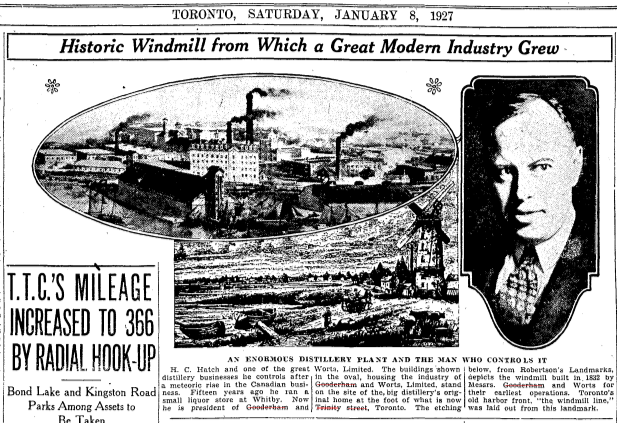 It clues us into the early geography and industry of York and later Toronto. 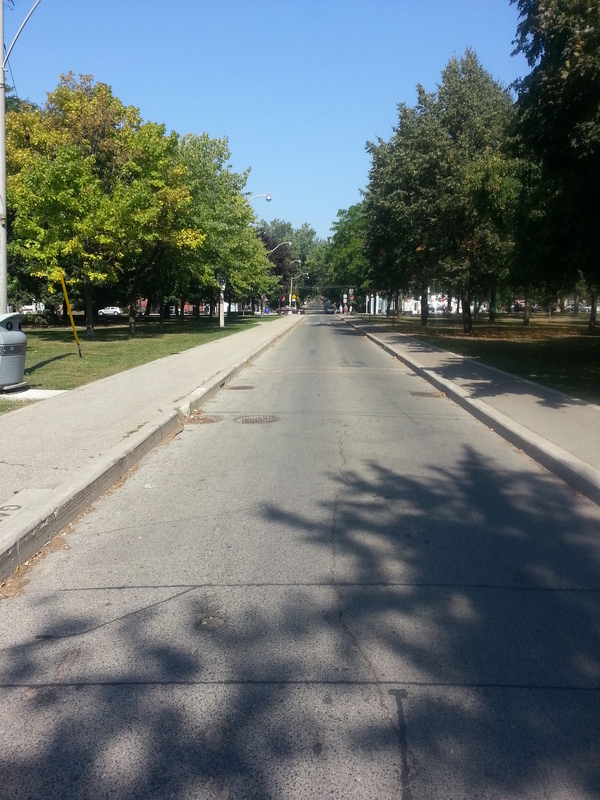 In tracing its former course, I followed its Discovery Walk from Bloor to Queen Street. The Garrison ran a longer distance than what I track. 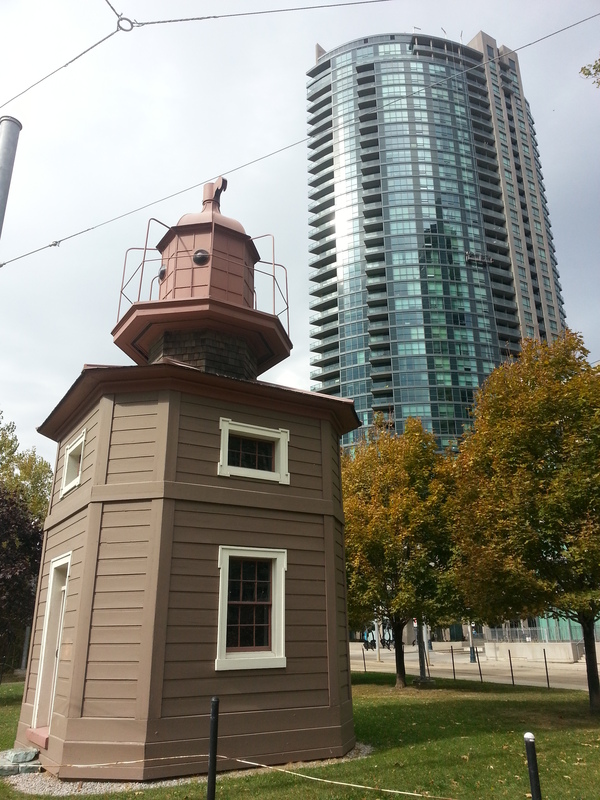 For one, the Discovery Walk itself ends at Fort York, which gave the waterway its name. But north of Bloor, it extends to St. Clair. 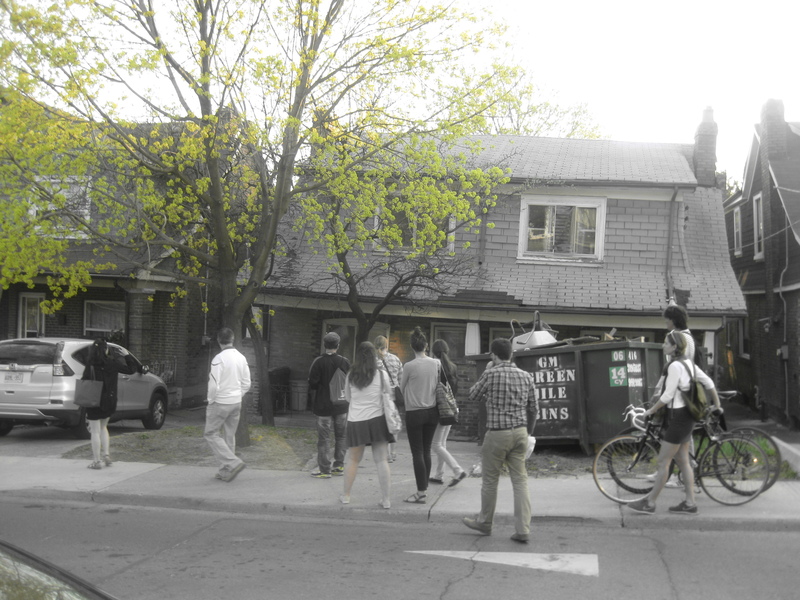 On Shaw, the creek exacts its revenge on a slanted house, deemed the crookedest home in Toronto, which was put up for sale in July 2015. 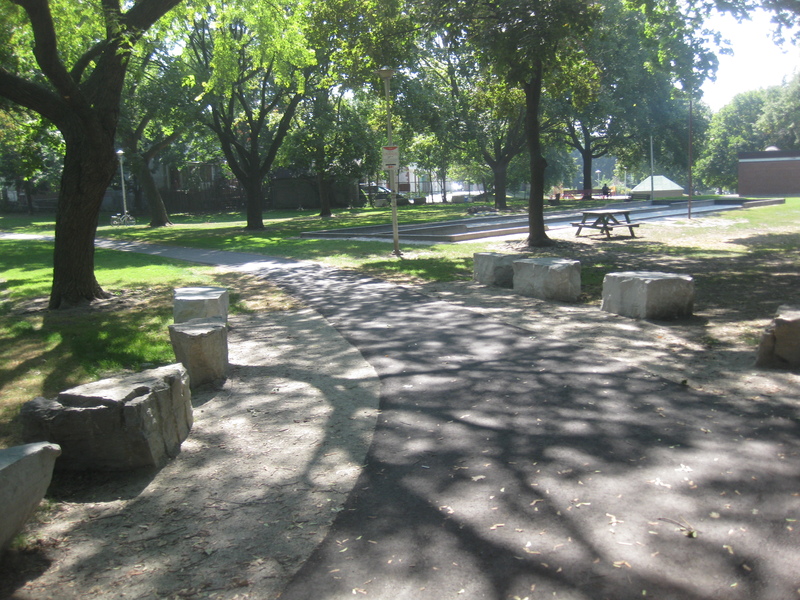 The rolling counters of the Christie Pits Park is a product of the creek, whose rich river bed lent itself favourably to the sand operation that stood here in the 19th century (much in the same way that the creeks of Leslieville propped up the area’s clay and brick industry). 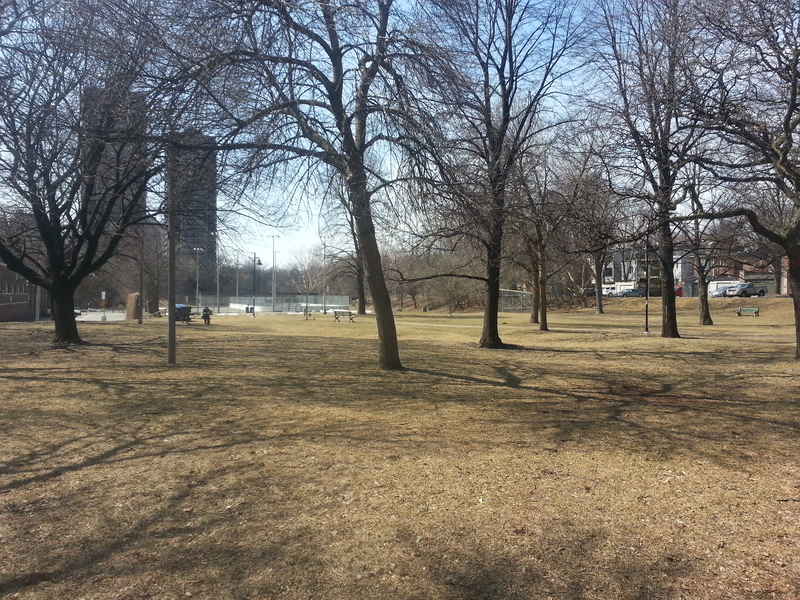 To its south, Christie Pits has sister green space in Bickford Park, whose history and geography is very similar. With the Garrison running through its centre, there was a brickyard here too. 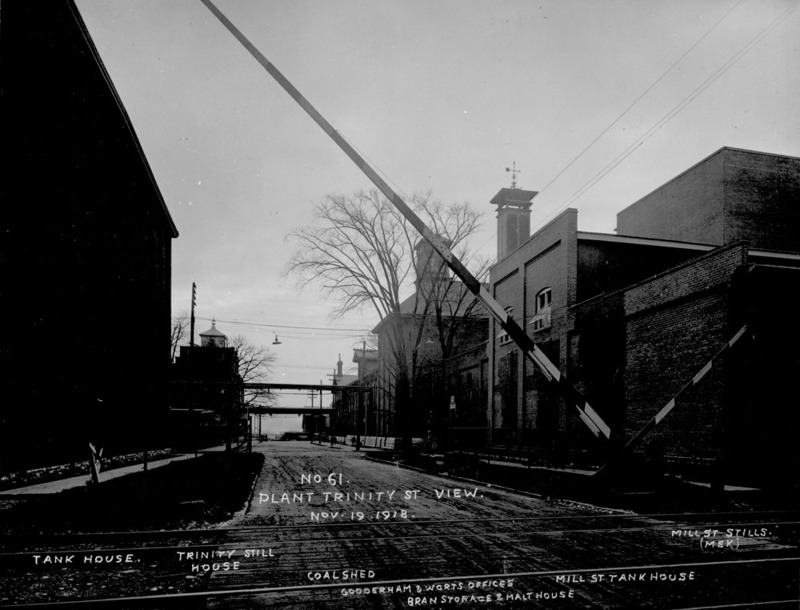 The surrounding neighbourhood on much of Grace and Beatrice Streets and its various laneways (including the arty garage-lined alley bordering Bickford) was filled in after the yard ceased operations in the early 20th century. 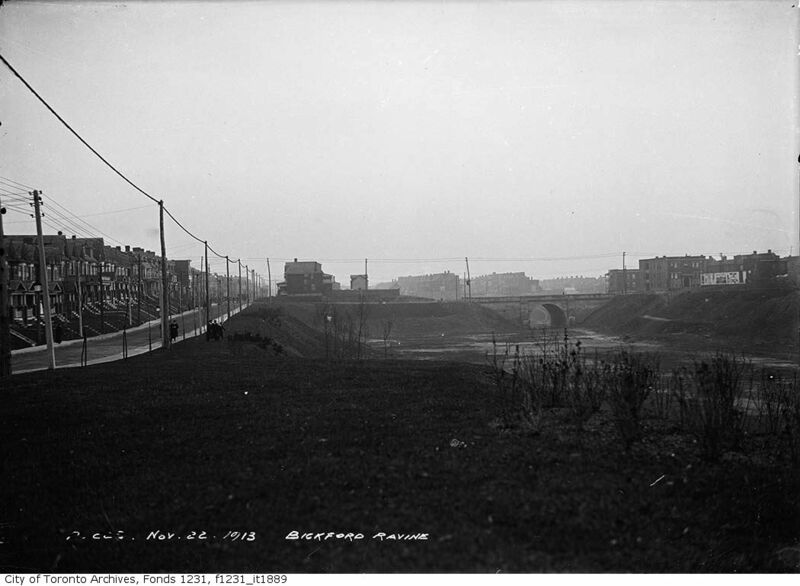 Christie Pits and Bickford amount to accidental parkland in my mind: places of industry that weren’t earmarked to be recreational spaces but that ended up being so after outliving their original uses. 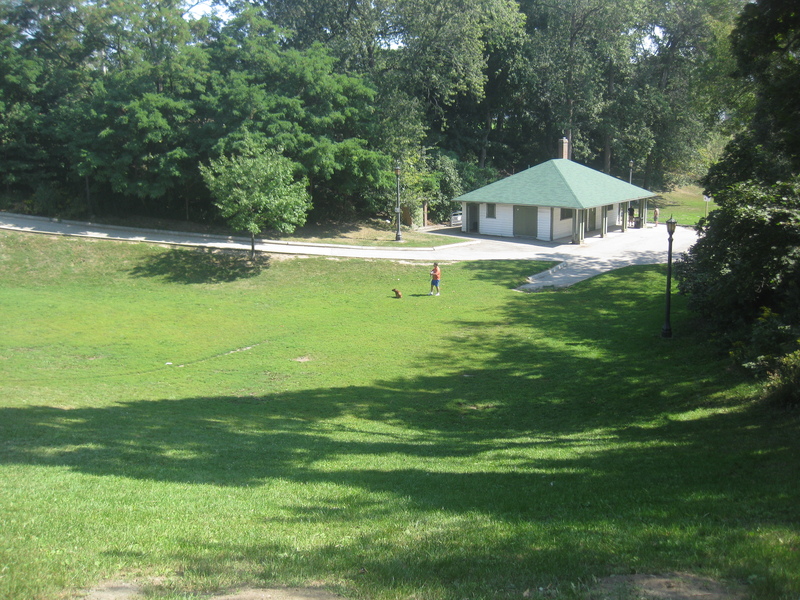 It’s a more-common-than-expected origin story of Toronto parks. Source: Goad Fire Insurance Atlas, 1903. 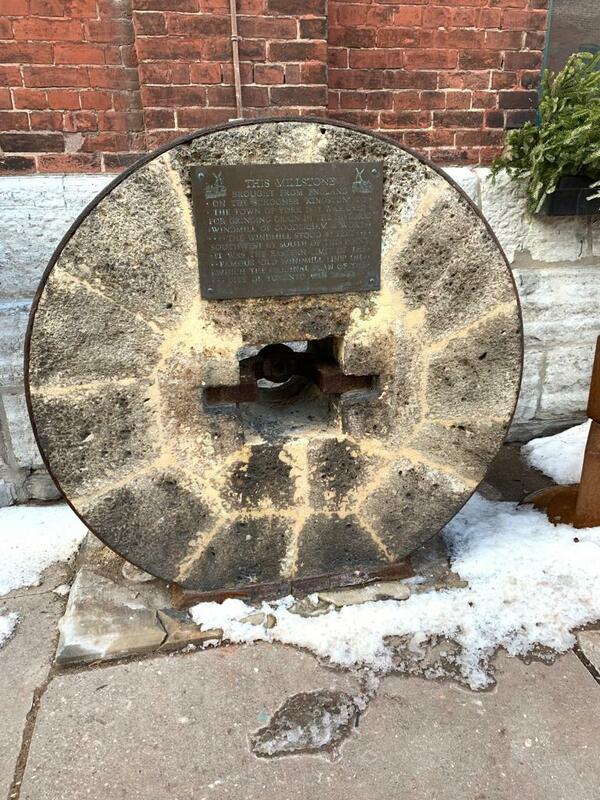 On Harbord, a tombstone rises out of the street as a monument to the 1905 bridge that’s buried beneath it. It’s the first of two on this walk. South of it, through what is now the levelled Art Eggleton Park (named for the former mayor), the valley is just infill. 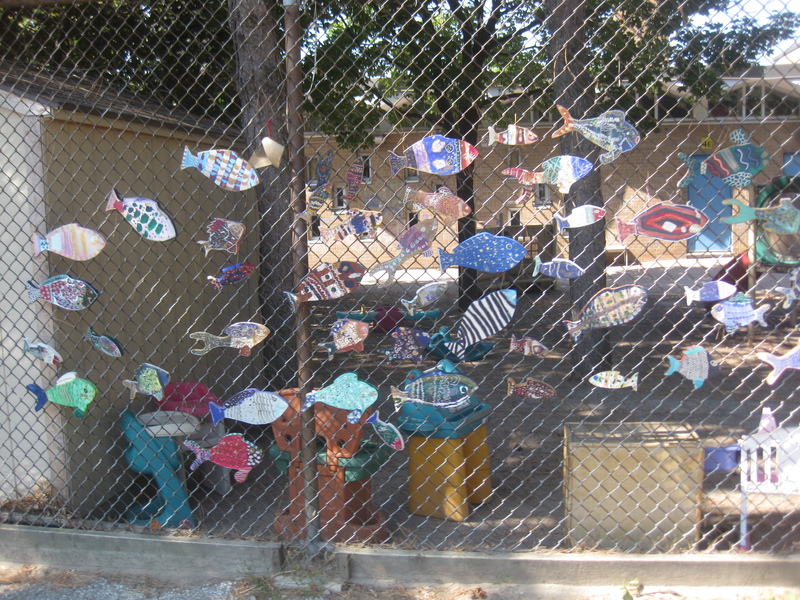 In the yard of Montrose Junior, a school of fishys swim alongside the school of students. 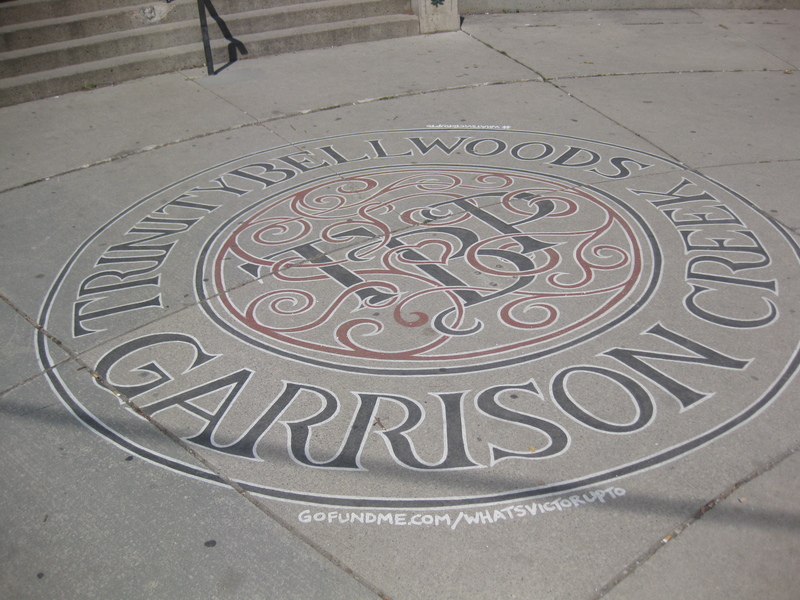 The Garrison may be gone, but its effect on the layout of Toronto is very much apparent. 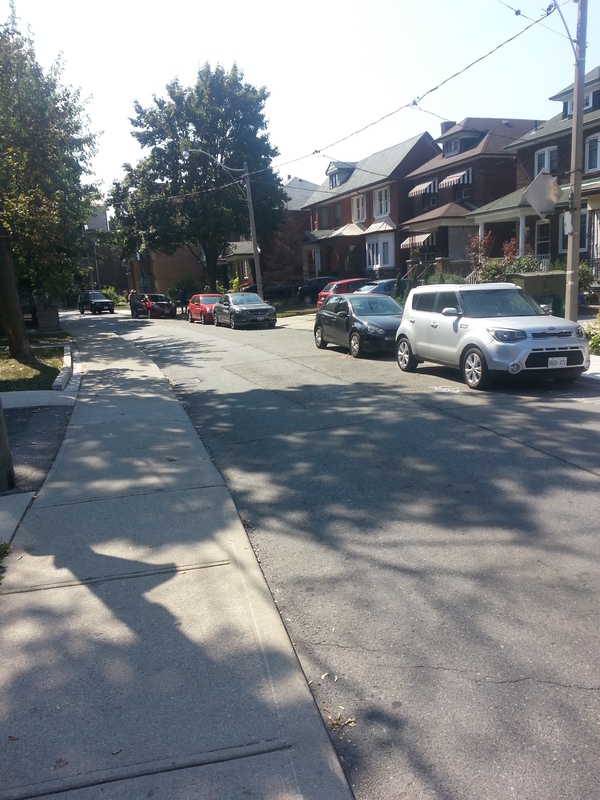 The odd curvy configuration of Crawford & Montrose Streets follows the creek’s path, and further dispels the myth that Toronto is a perfectly formed grid. Source: Toronto Historic Maps, 2015. 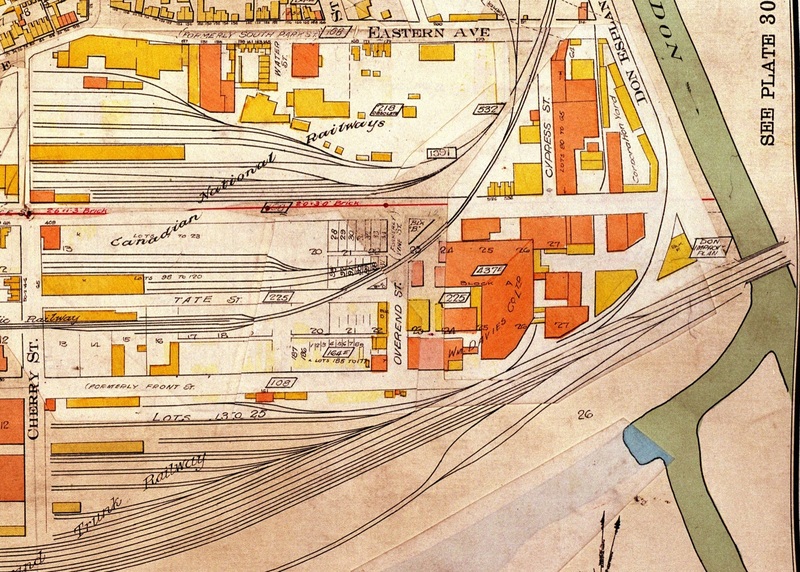 Source: Toronto Historic Maps, 1899. 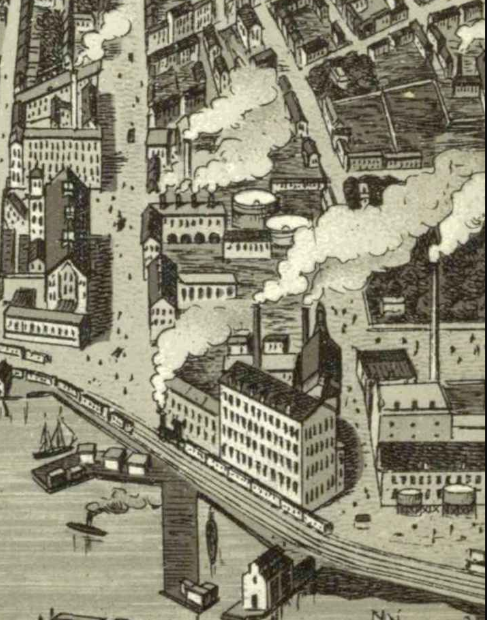 Source: Toronto Historic Maps, 1858. 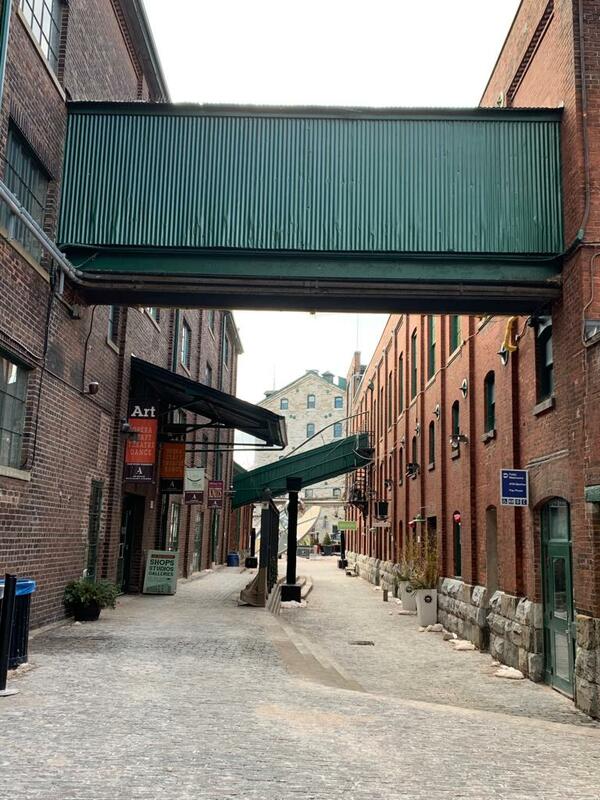 Onwards, the Garrison path passes through College’s Little Italy, where the heritage listed MOD club and Revival Bar stand. The former was the 1922 Great War Veterans’ Association (GWVA) Clubhouse and the latter was the Brethren Mission built in 1910. 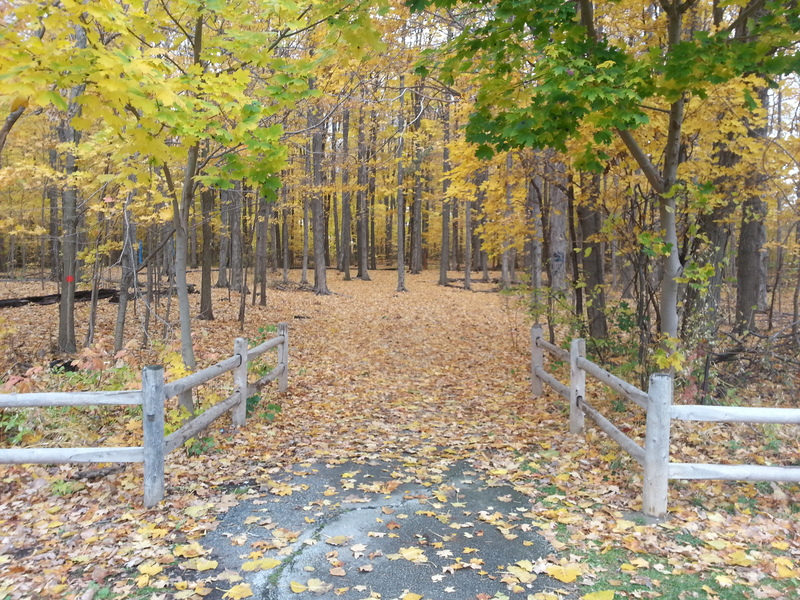 The ravine’s parade through parkland continues through the less famed, yet quite peaceful Fred Hamilton Park. 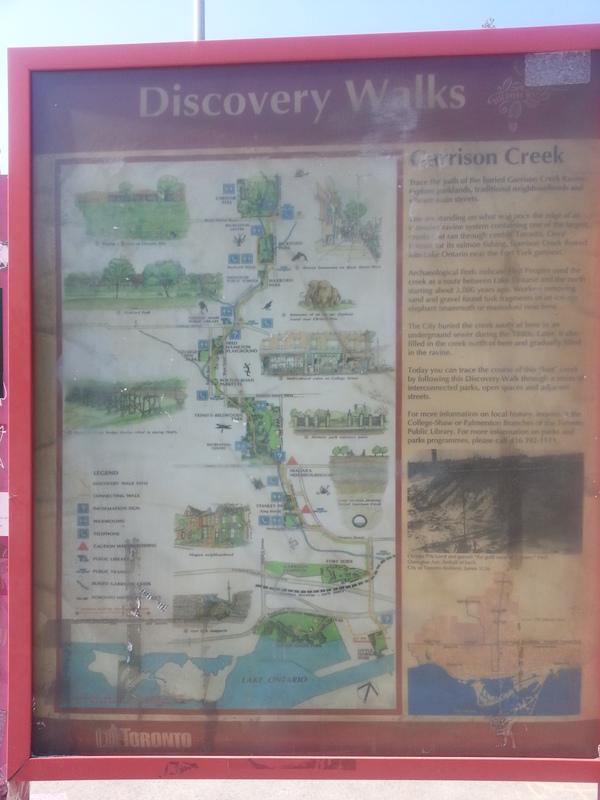 The Discovery Walk route has its own wayfinding arrows to direct people, but there are other markers alerting people of the ravine’s one time presence through the area. 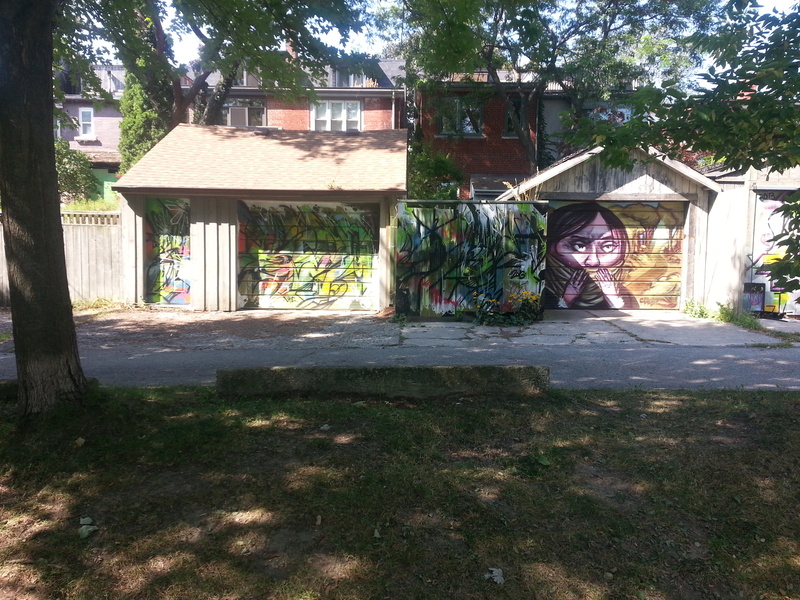 At the end of Roxton one comes to Dundas West’s Little Portugal and Trinity Bellwoods Park. 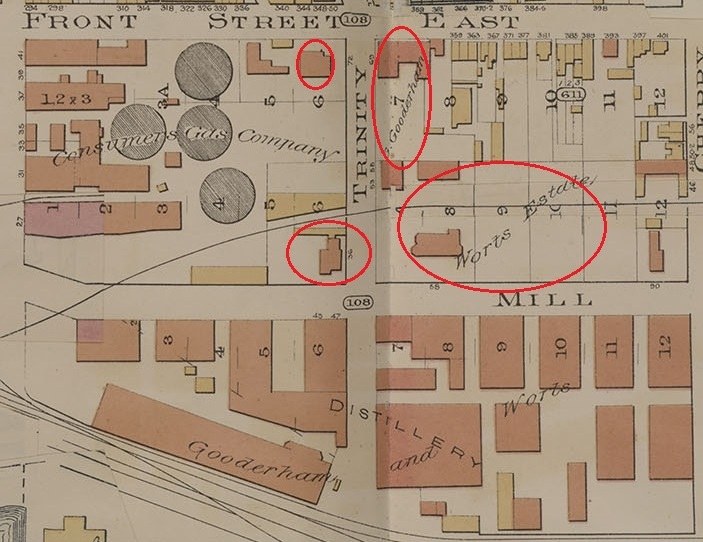 Its northwest corner is the original Bellwoods Park, as labelled by early maps. 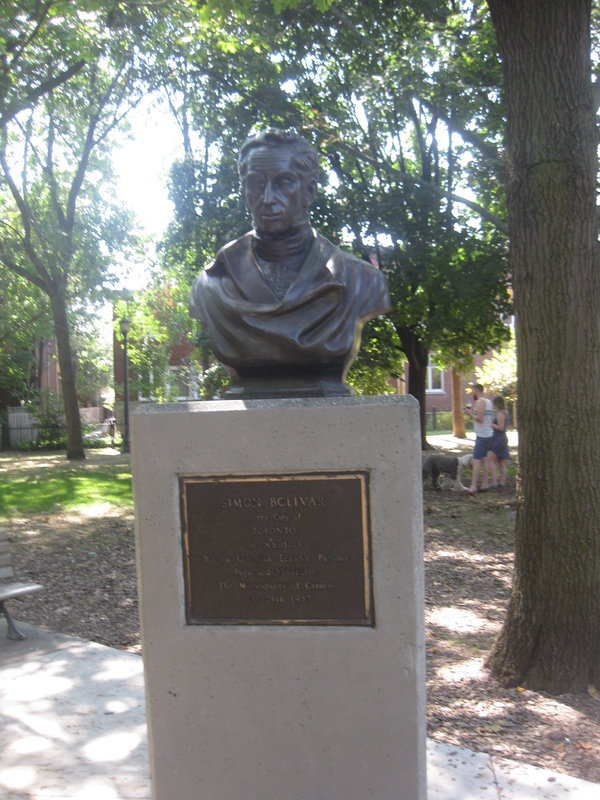 There’s a pleasant discovery in the statue of Simon Bolivar, the liberator of South America. 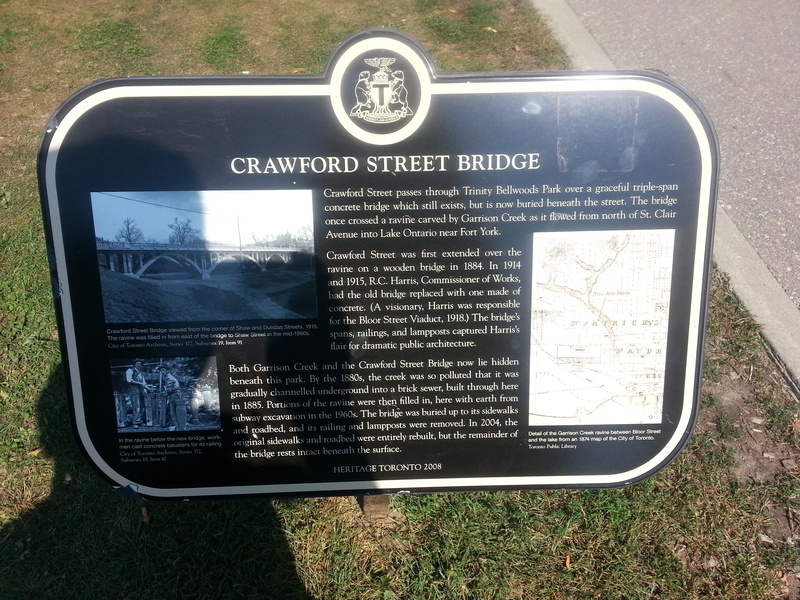 At Crawford Street, there’s a Heritage Toronto marker for the second lost bridge of the walk. 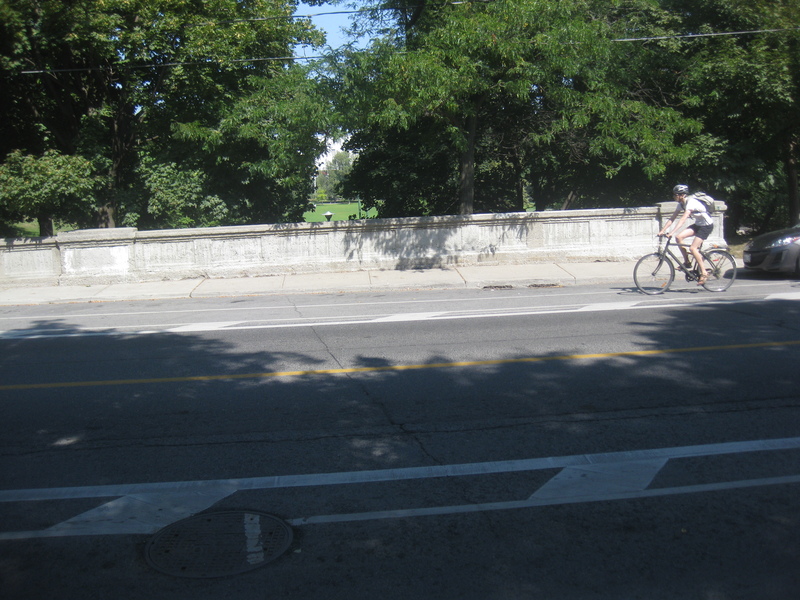 Beyond the plaque, there’s no remnant of the Crawford Street bridge’s existence. 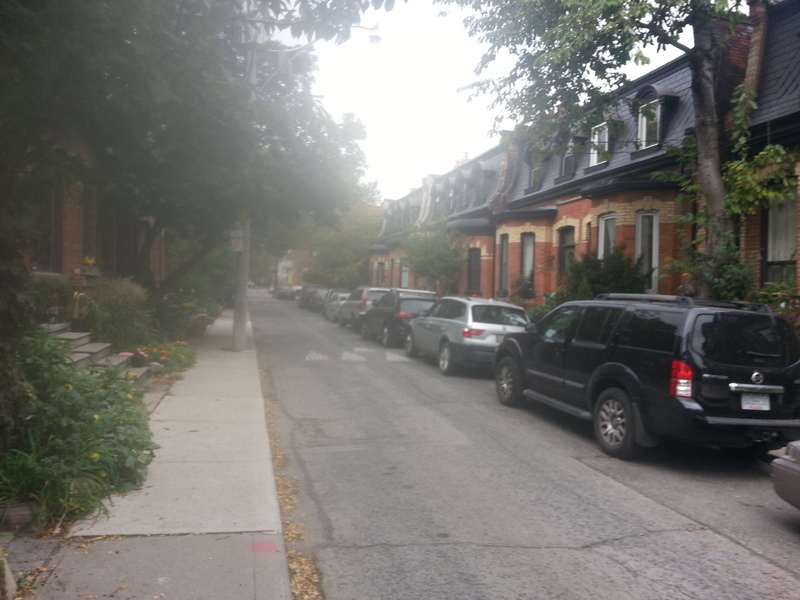 Like Harbord, its valley too is infill. 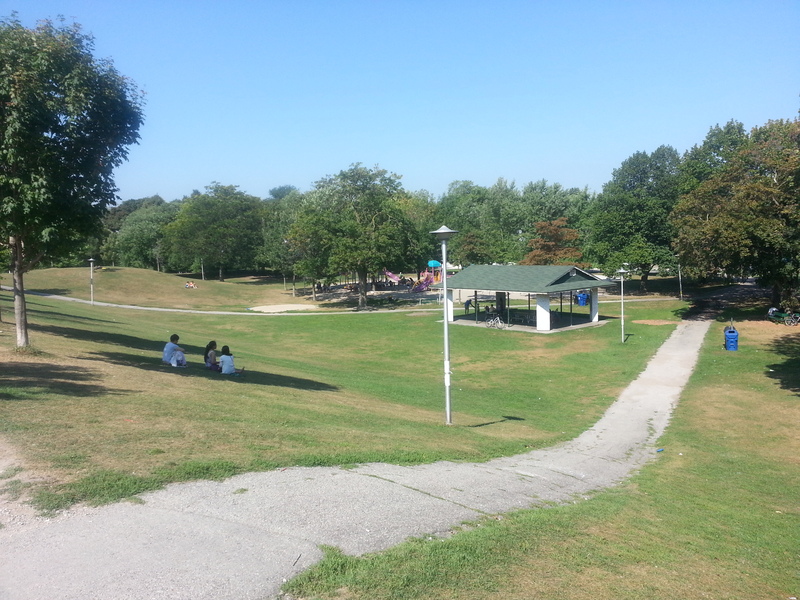 But fortunately, interesting topography doesn’t completely escape the park – there are toboggan hills here too. 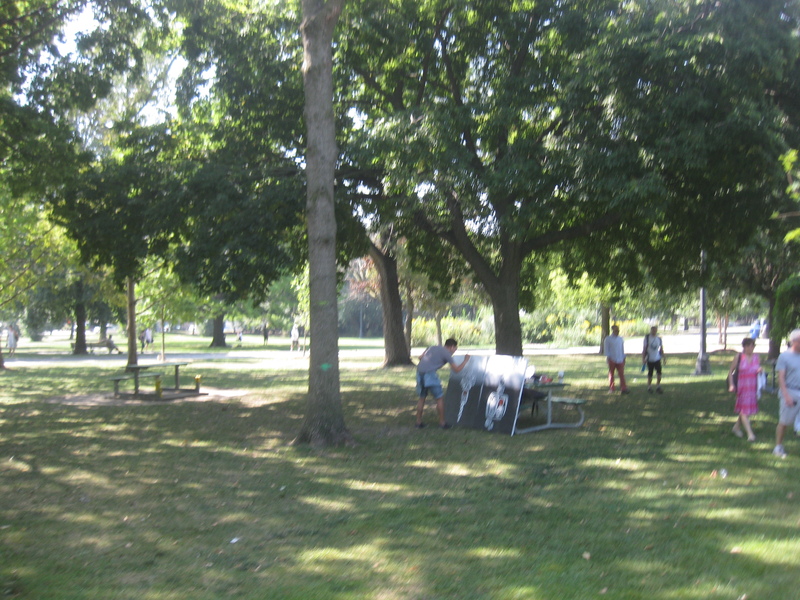 As expected, Trinity Bellwoods is well used on this day. 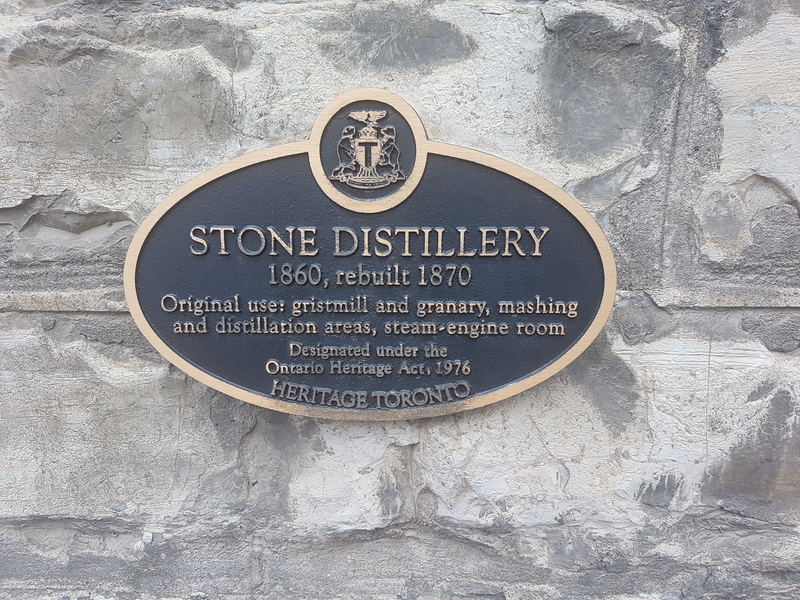 It is tooted as a hipster haven in grand Toronto lore, but that label shouldn’t stop peoples of all demographics from using it. It’s so celebrated that 1990s & 2000s Canadian rock outfit, Treble Charger, sang about it. At its south end, ornate gates mark the Queen Street entrance to the park. The gates put the Trinity in Trinity Bellwoods and are living memories of the original Trinity College whose buildings stood here for a century from 1852 to 1956. 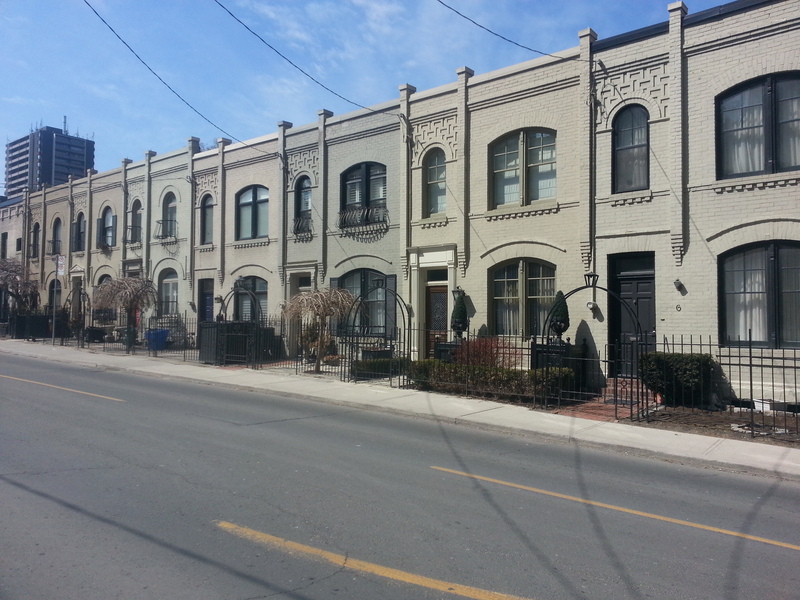 Queen Street has a perfectly lined streetscape, save for one building set back from everything else. This is the 1847 Georgian style John Farr house – at one time located on the banks of the Garrison as it crossed Queen Street. 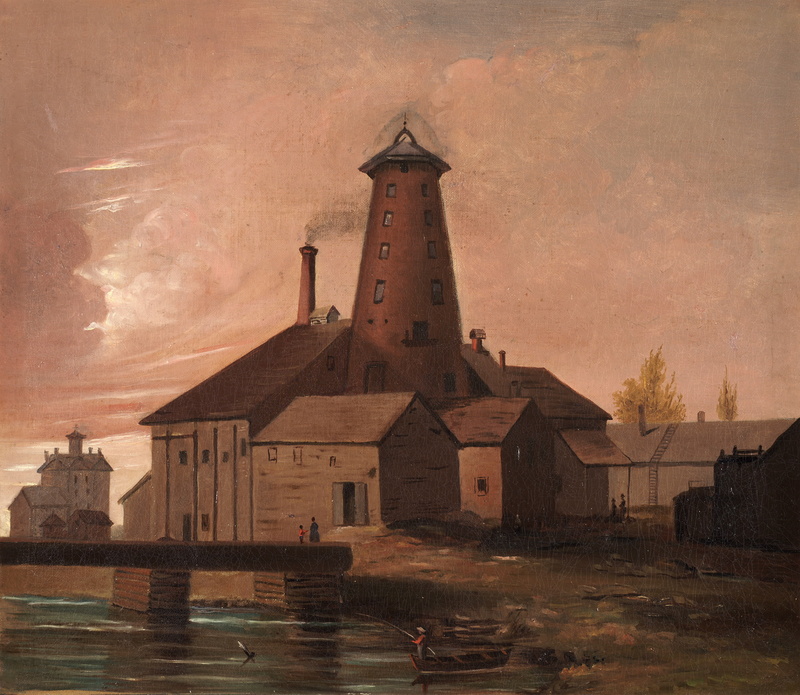 Farr was a brewer who made use of the creek for his enterprise. 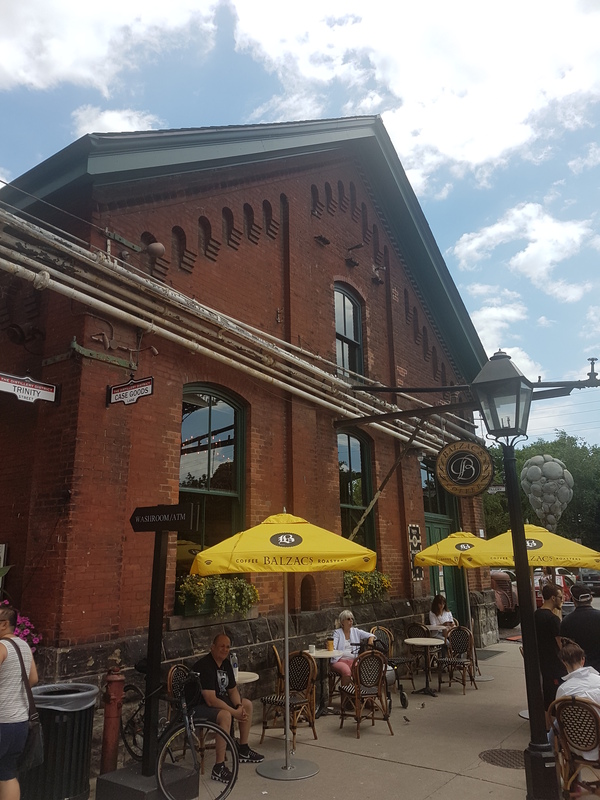 The brewing history of the Garrison has been well-researched and documented with amazing posts by Lost Toronto, the Black Creek Growler, and Doug Taylor as well as Jordan St. John’s recent and excellent book, Lost Breweries of Toronto. To uncover the creek even more, I recommend a look at this amazing, interactive, map-filled timeline created by public historian Alex Meyers. 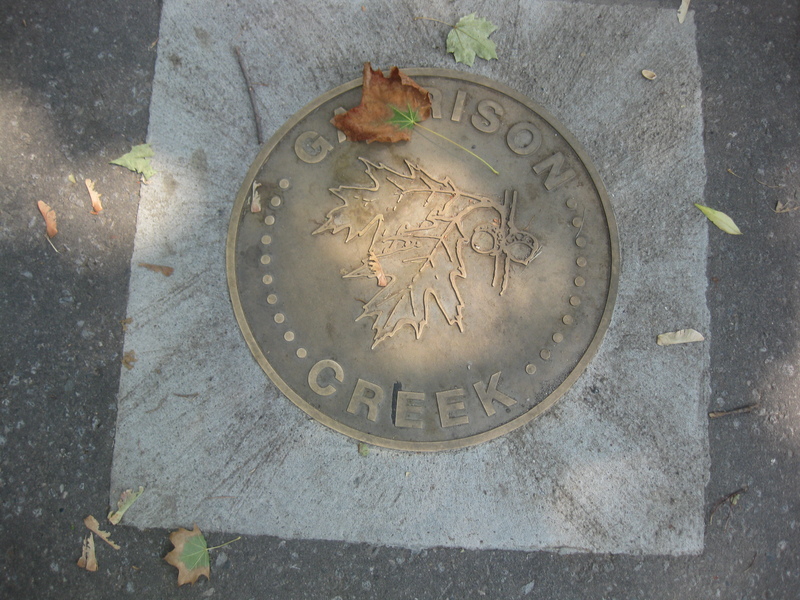 The written discourse about the Garrison as well as the various geographic and commemorative signs in its former path are amazing reminders that the creek’s existence is very much in Toronto’s consciousness.